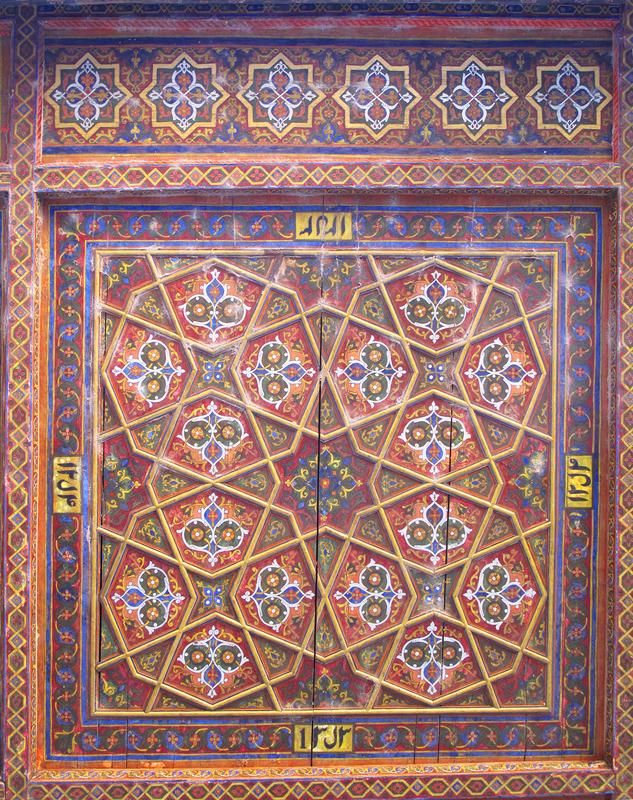 Aivan ceiling at Tash-Hauli Harem, Khiva, Uzbekistan. 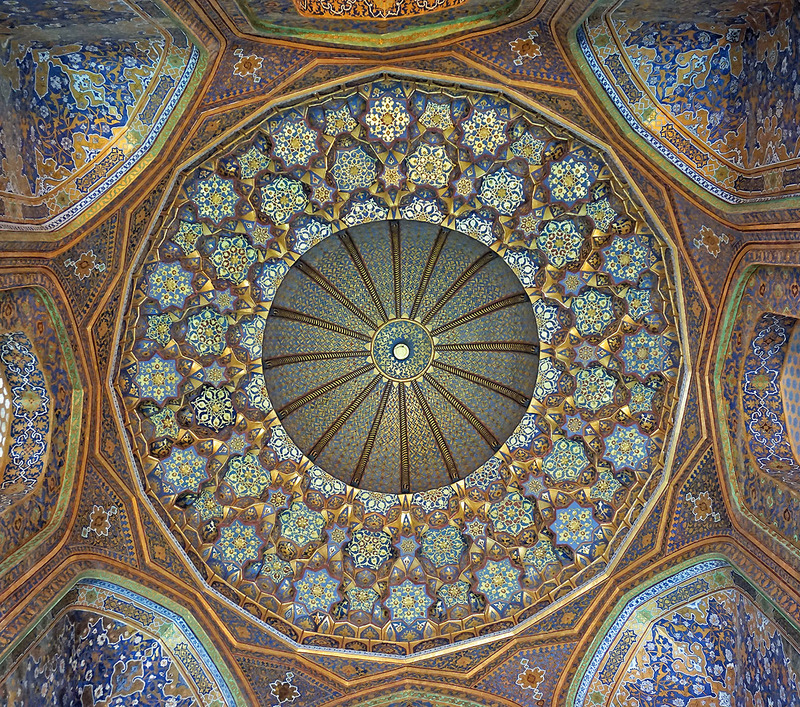 Ceiling in aivan at Tash-Hauli Harem, Khiva, Uzbekistan. 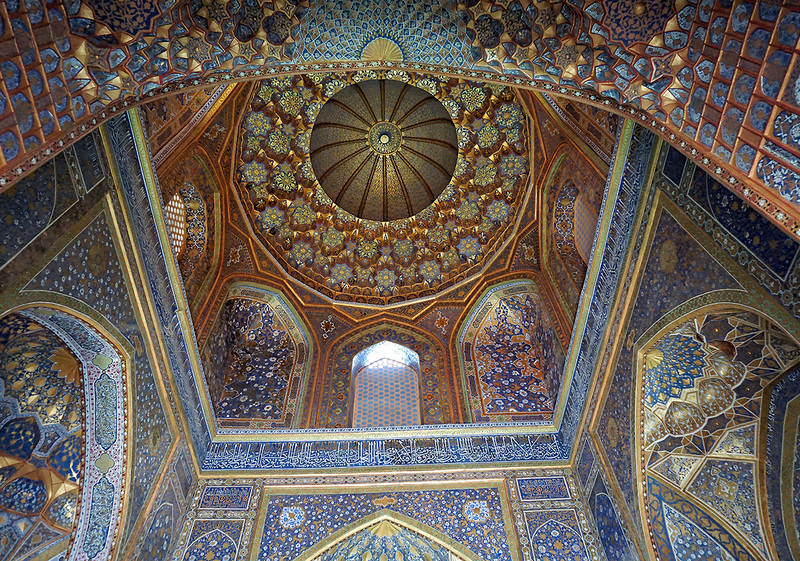 Yellow and blue Aivan ceiling at Tash-Hauli Harem, Khiva, Uzbekistan. 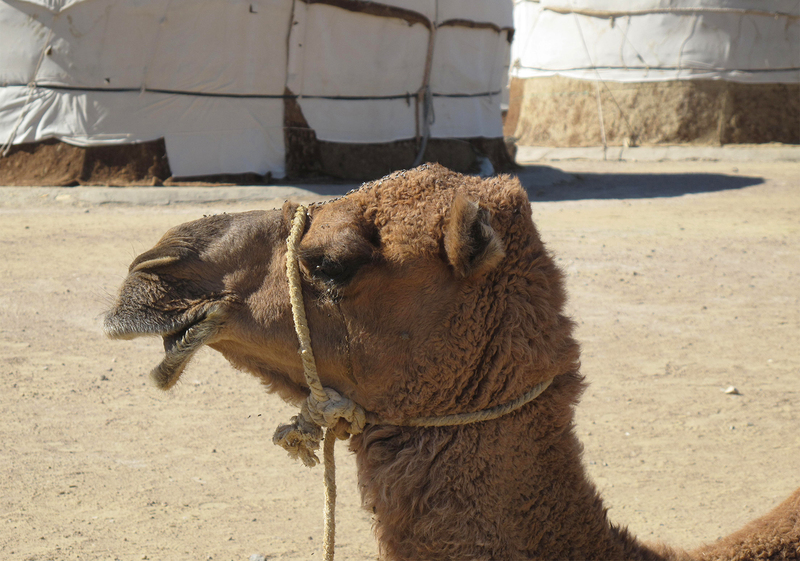 Camel at Yurt camp between Nukus and Khiva. 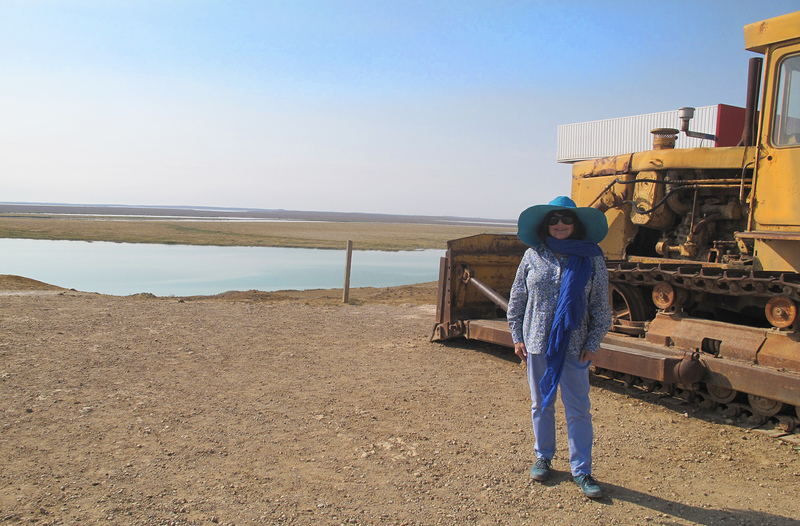 The term ‘The Silk Road’ brings to mind images of a bygone world, a world of crumbling cities, remote trading outposts and unforgiving terrain. 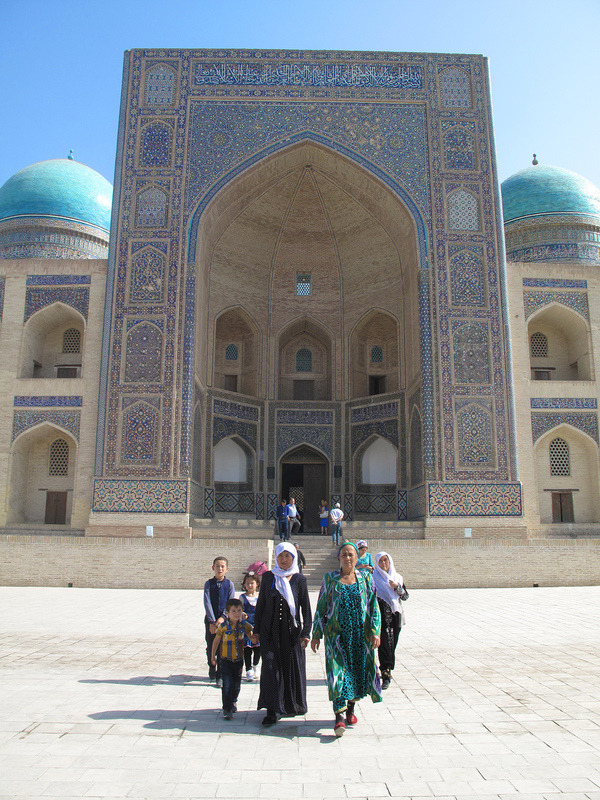 Our trip to the fairly remote and unknown republic of Uzbekistan brought some of these exotic images to life. 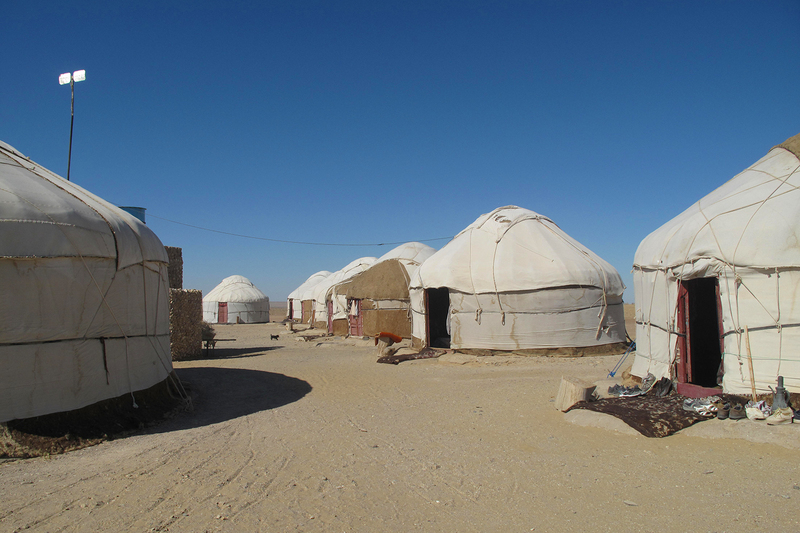 lunch stop at Yurt camp on route to Khiva. 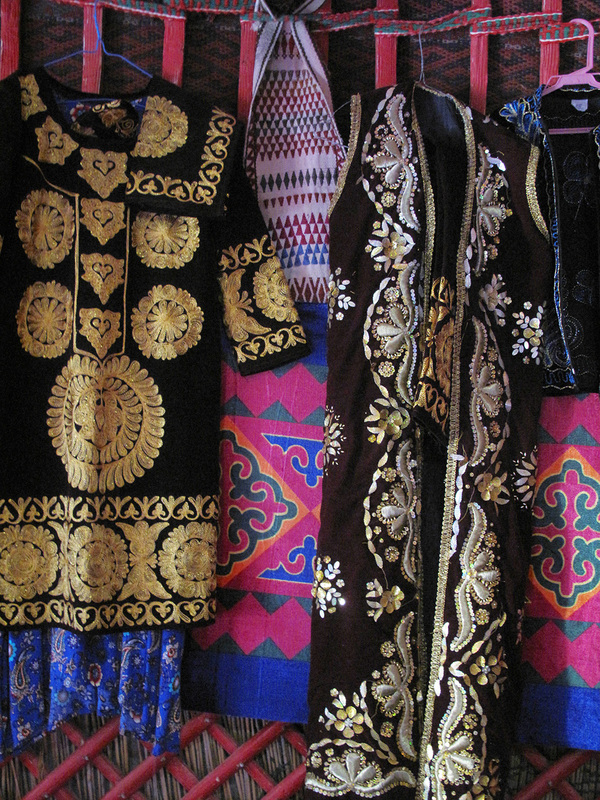 Yurt dresses belonging to our hostess. 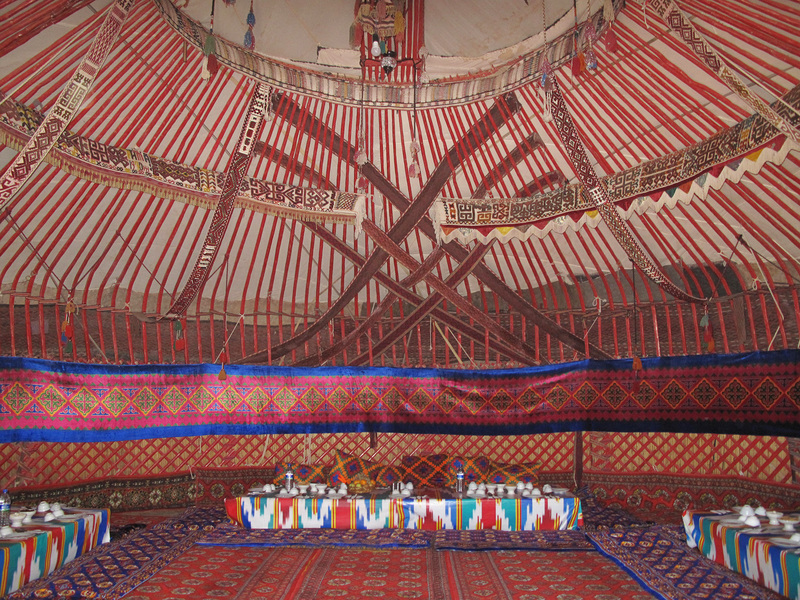 Tables set for our lunch stop at Yurt camp on route to Khiva. 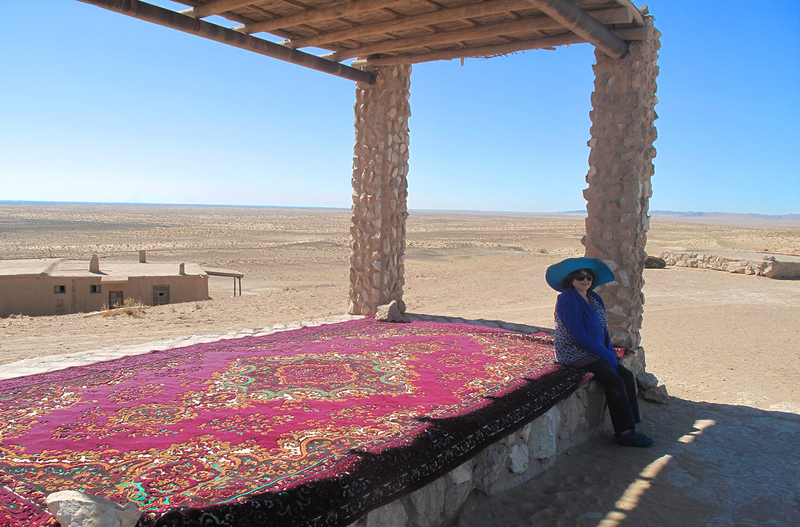 Our hostess at Yurt camp on the way to Khiva. View from Yurt at lunchtime. 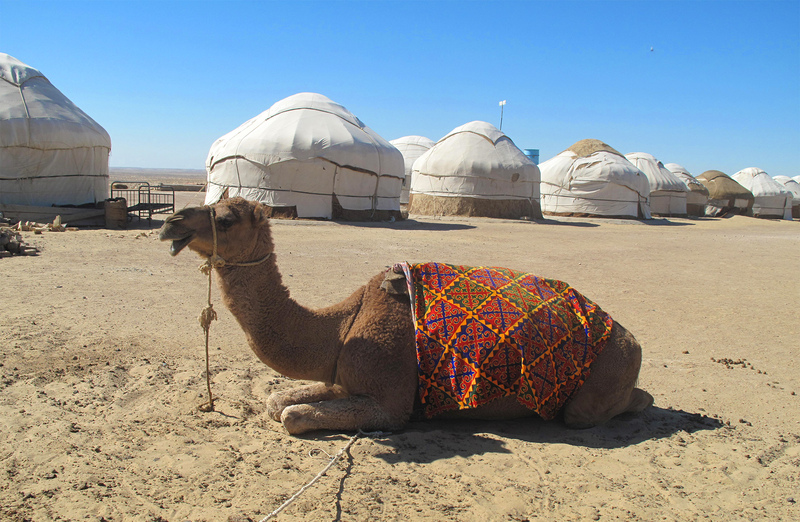 Yurt camp Camels in desert between Nukus and Khiva. 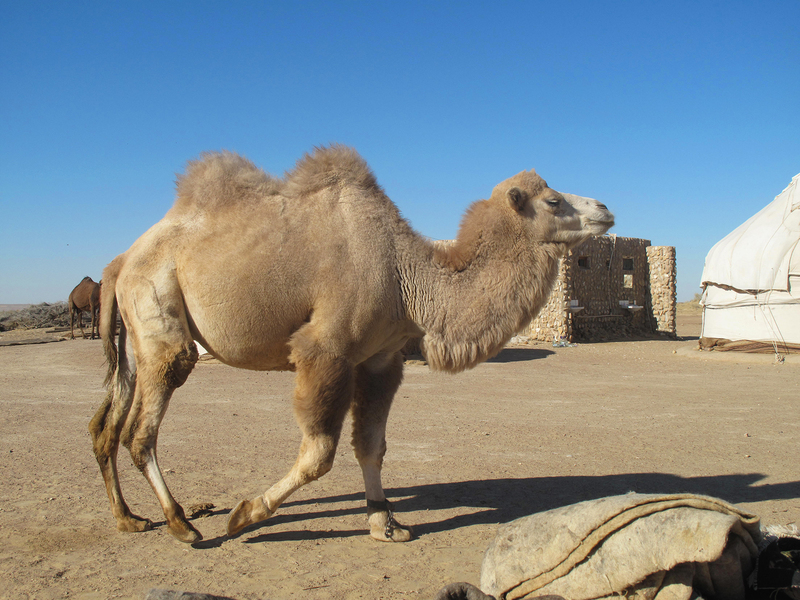 Camels at the camp on our way to Khiva. They can become a nuisance to the yurt dwellers. A shady spot outside the yurt camp. 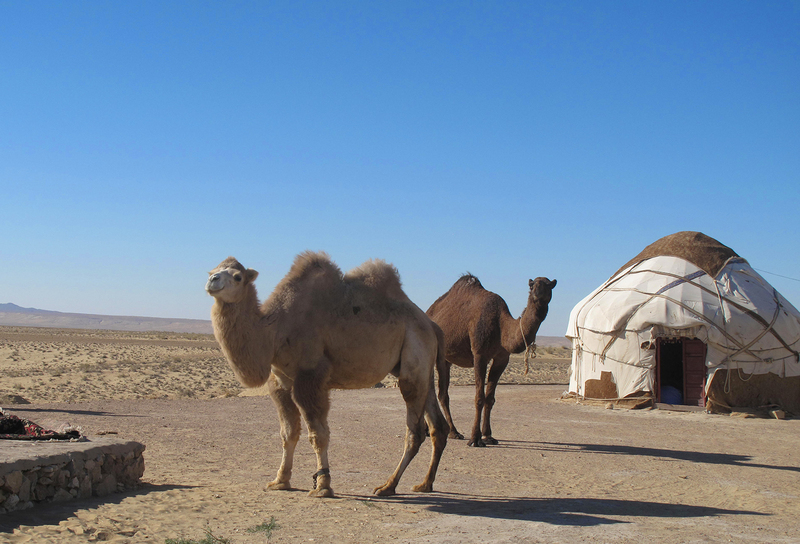 Camel stop at Yurt camp on route to Khiva. 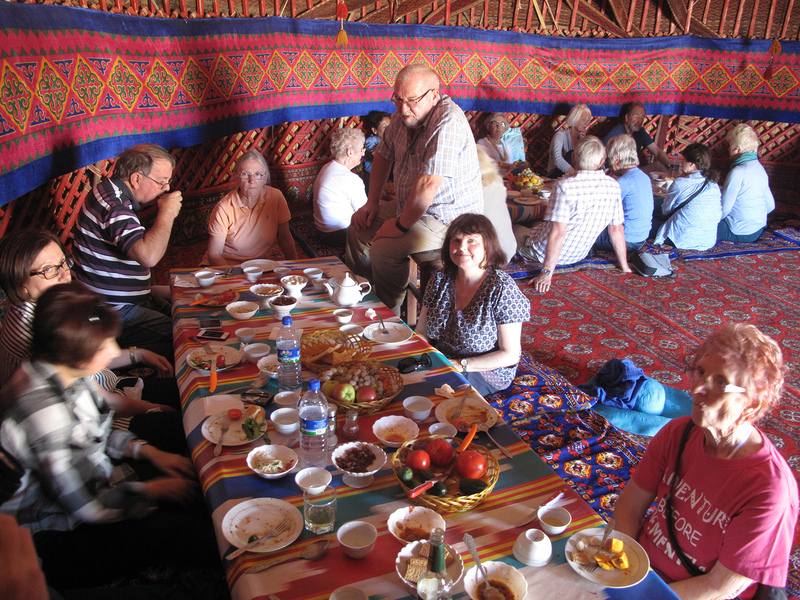 Lunch in Yurt on way to Khiva. 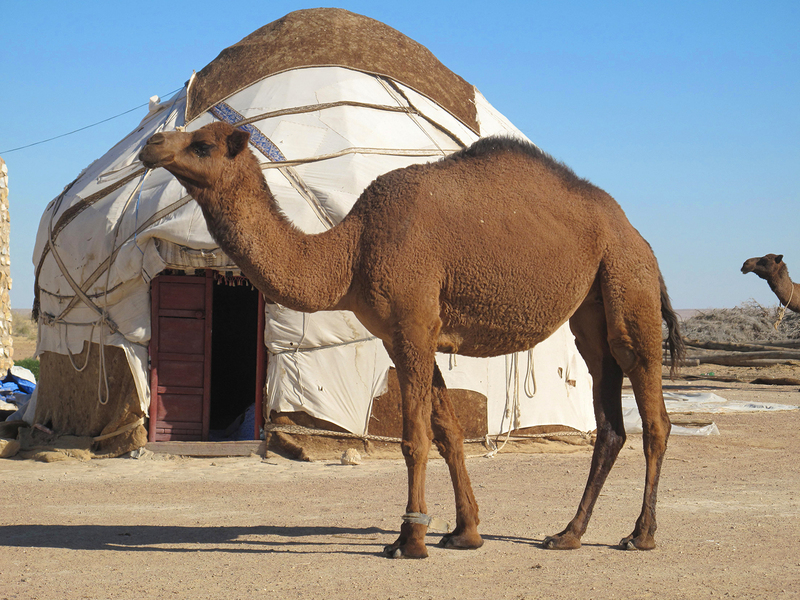 Flouncy camel at Yurt camp, she knew she was beautiful ! 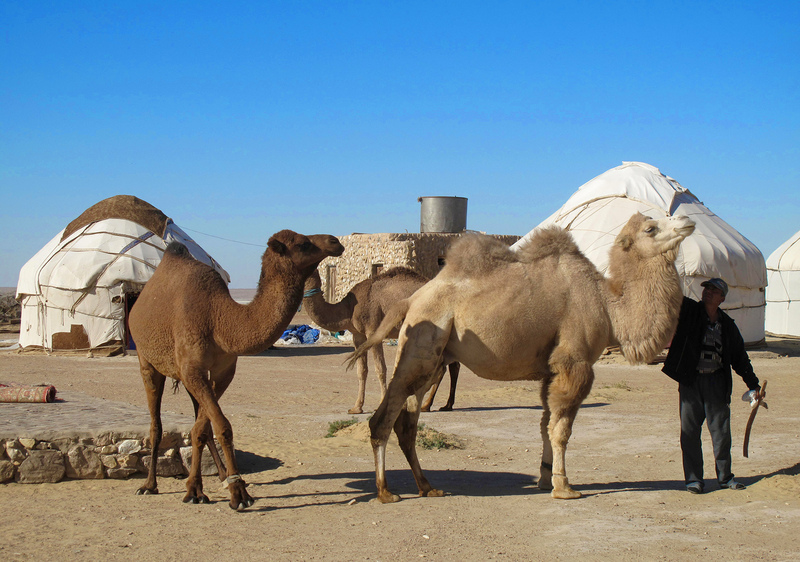 Camels at the camp on our way to Khiva. 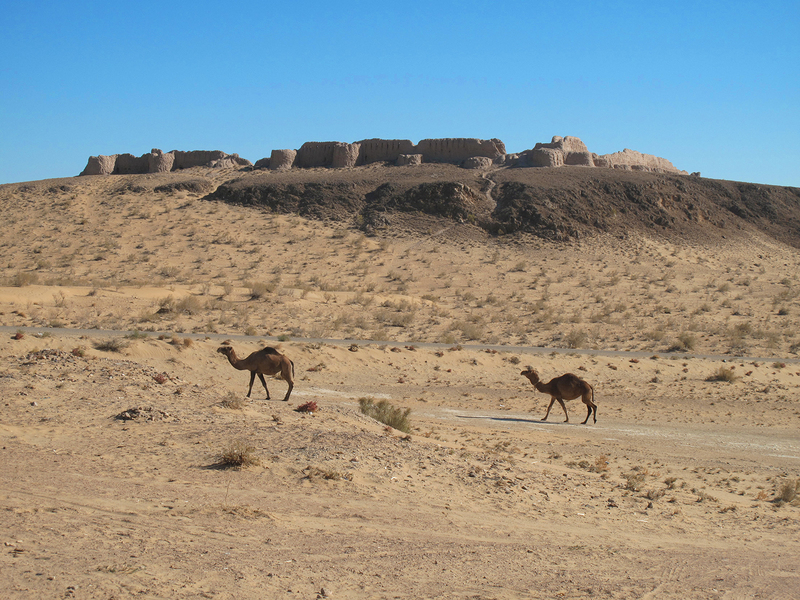 View from yurt camp to ancient Zoroastrian settlement. 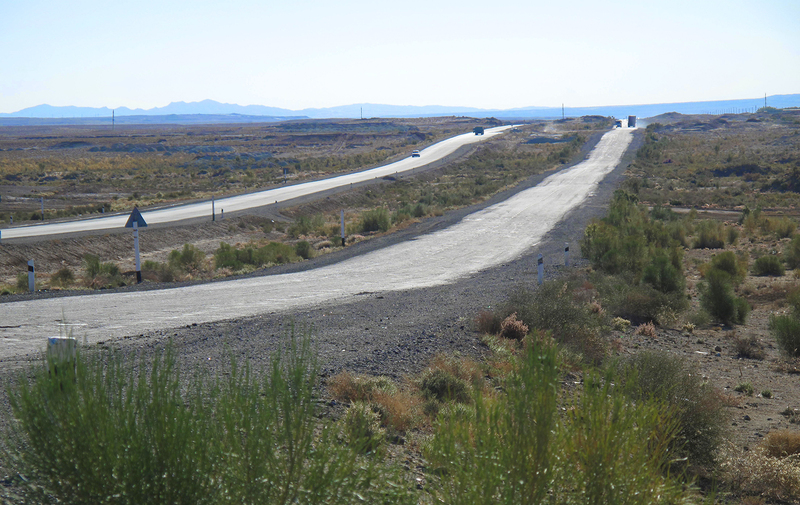 The Silk Road was a network of trading routes that connected China with the West in ancient times. The name ‘The Silk Road’ only came into use in the 19th century, yet it has existed for over 2,000 years, with some routes changing over time, its meandering trails following rivers, crossing, deserts and climbing mountain passes; transporting precious silk and other goods through the heart of Central Asia. Silk road from Nukus to Khiva, Uzbekistan. 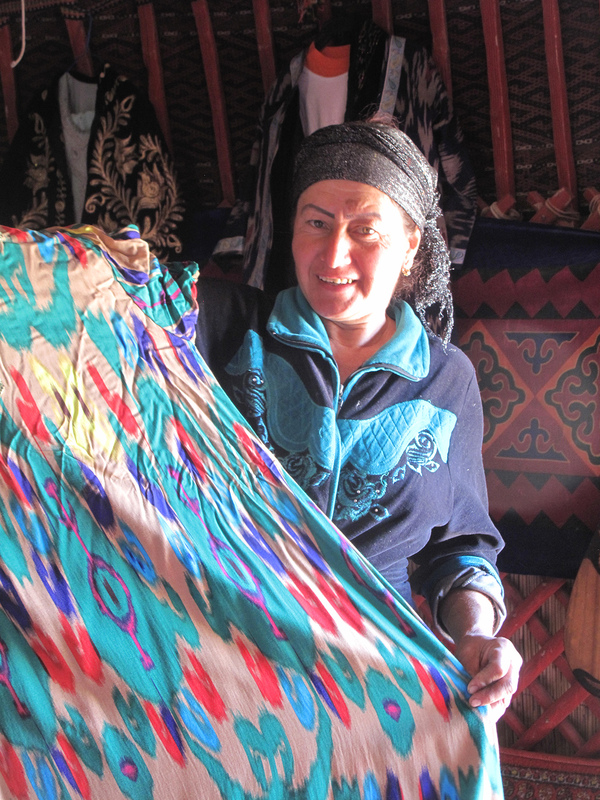 It became known as ‘The Silk Road’ because silk was one of the key goods traded along the route. The Chinese had learned how to manufacture this luxurious material from silkworms as early as the third millennium BC and for a long time, they were the only people who could produce it. 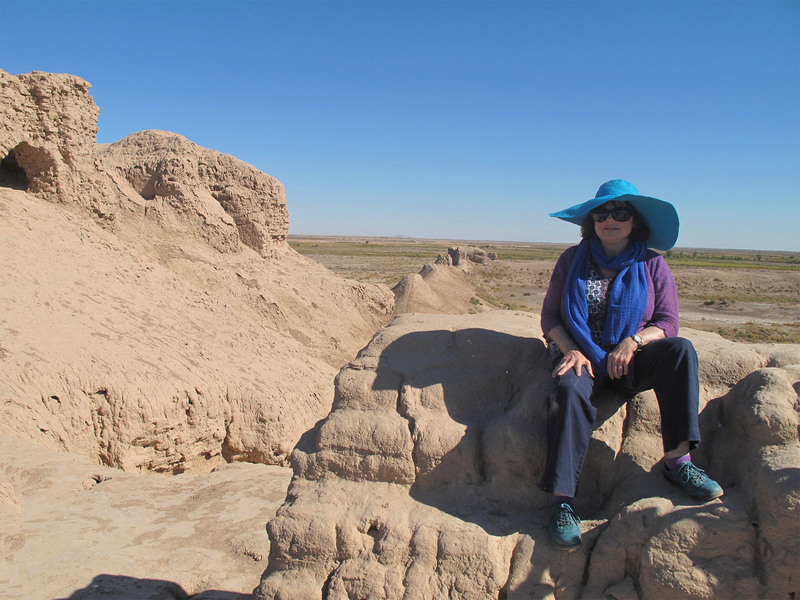 Sitting on ancient remains of Zoroastrian city, Nukus area, Uzbekistan. 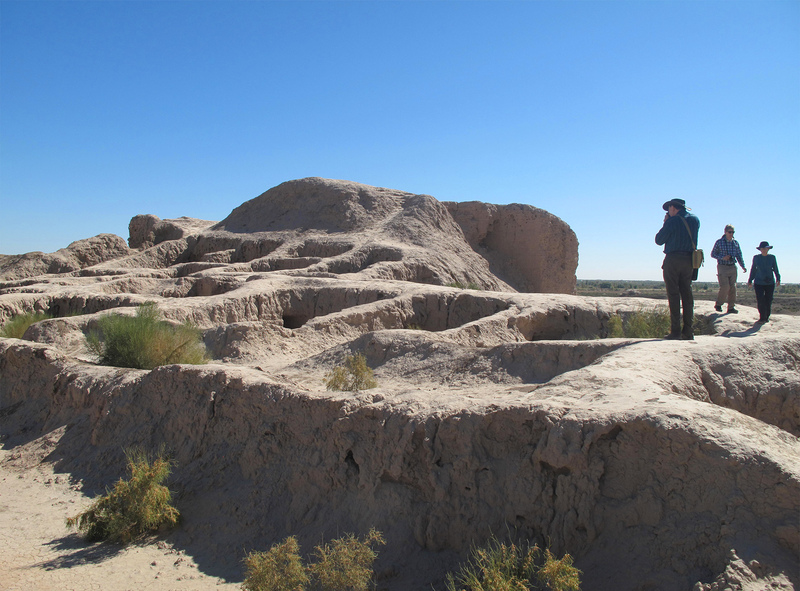 Zoroastrian remains of an ancient city, Nukus, Uzbekistan. 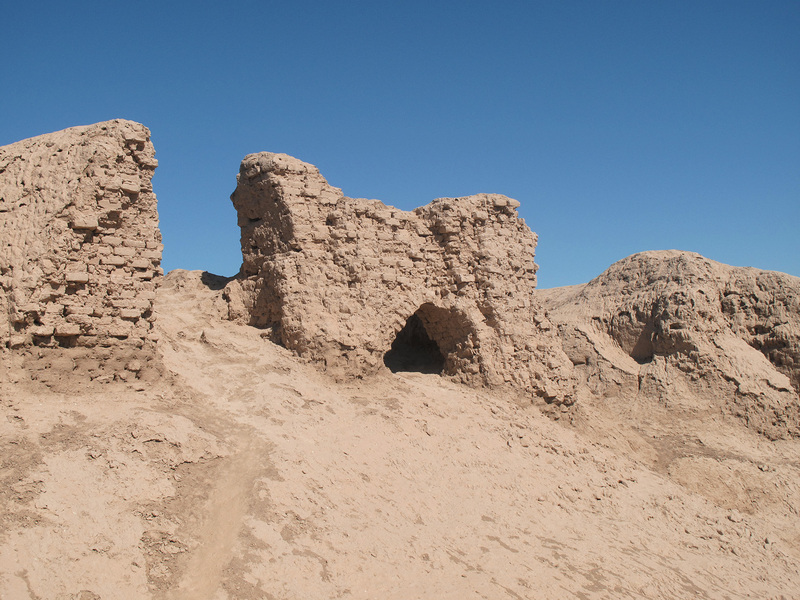 Ancient ruins of a Zoroastrian city, Nukus, Uzbekistan. 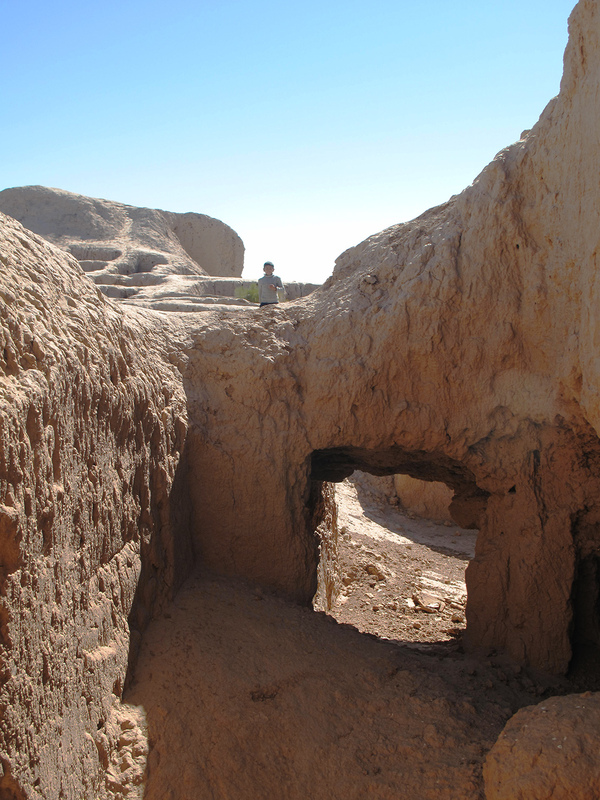 Zoroastrian ruin, Near Nukus, Uzbekistan. 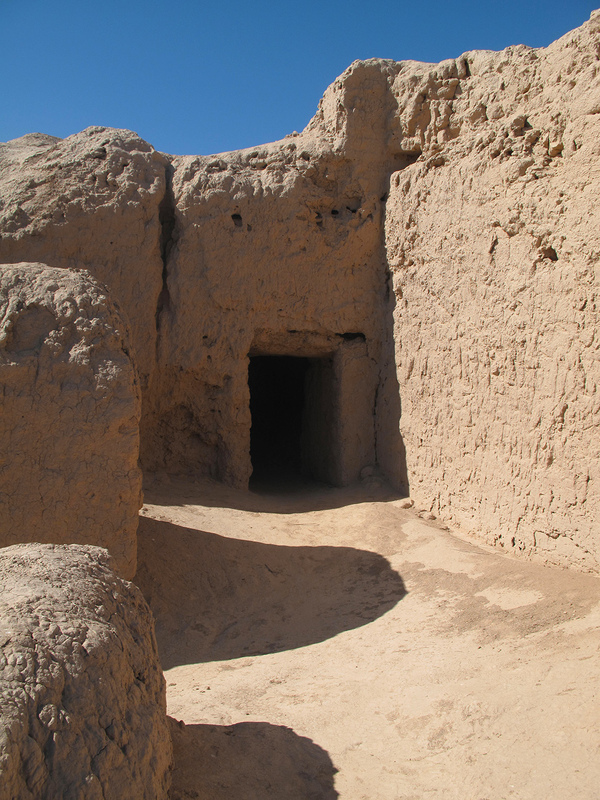 Zoroastrian remains of an ancient civilization. Mud walled city of Khiva,Uzbekistan. 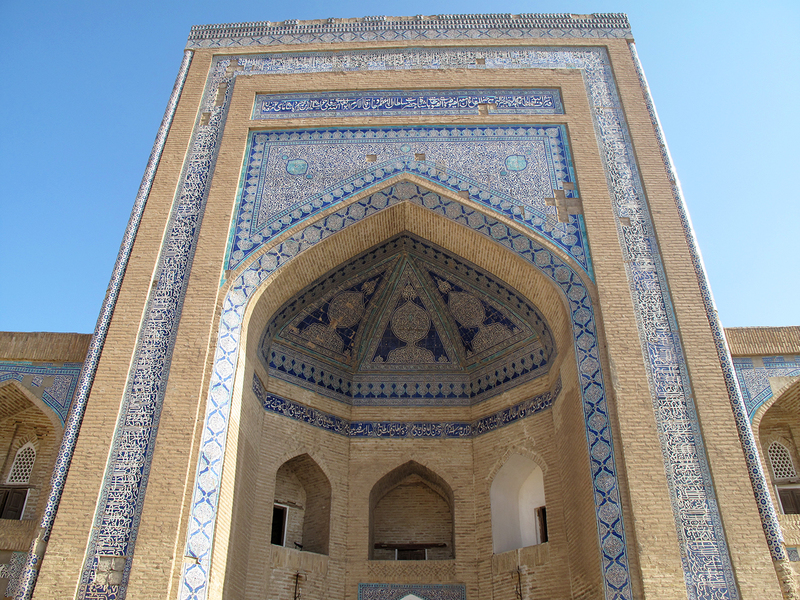 Gate to the city of Khiva, Uzbekistan. It is said that in 138 BC, the Chinese emperor dispatched an envoy called Zhang Qian to make contact with a tribal group in central Asia. Zhang was captured and kept prisoner for several years, but he was eventually freed and returned to China where he described the magnificent Arabian horses he had encountered. The Chinese authorities were keen to acquire these horses and so began a system of long-distance trade with central Asia. 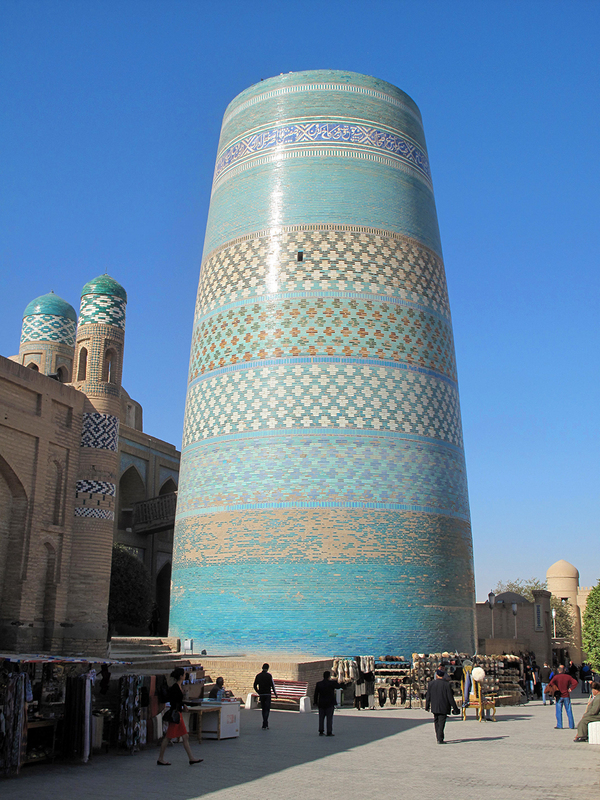 Muhammad Amin- Khan Minaret Minor, Uzbekistan. 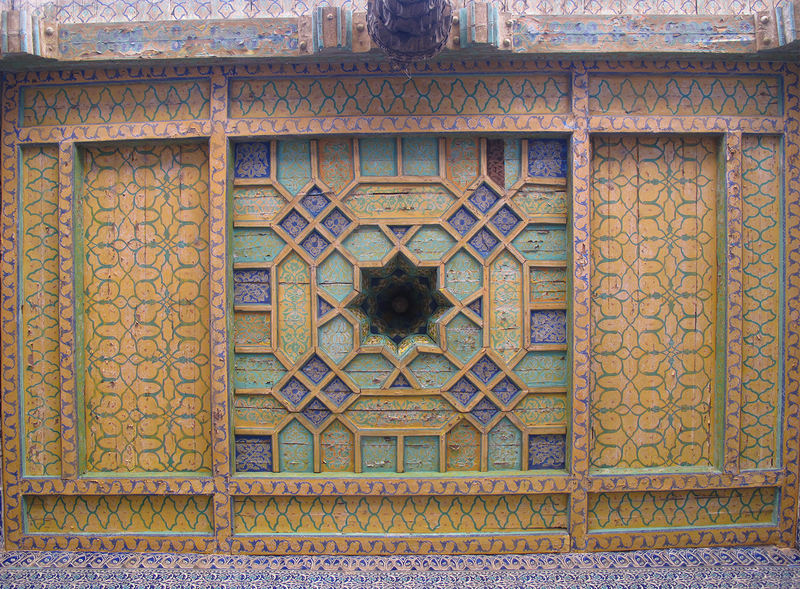 Majolica tiles on wall at Kunya-Ark, Mosque, Khiva. 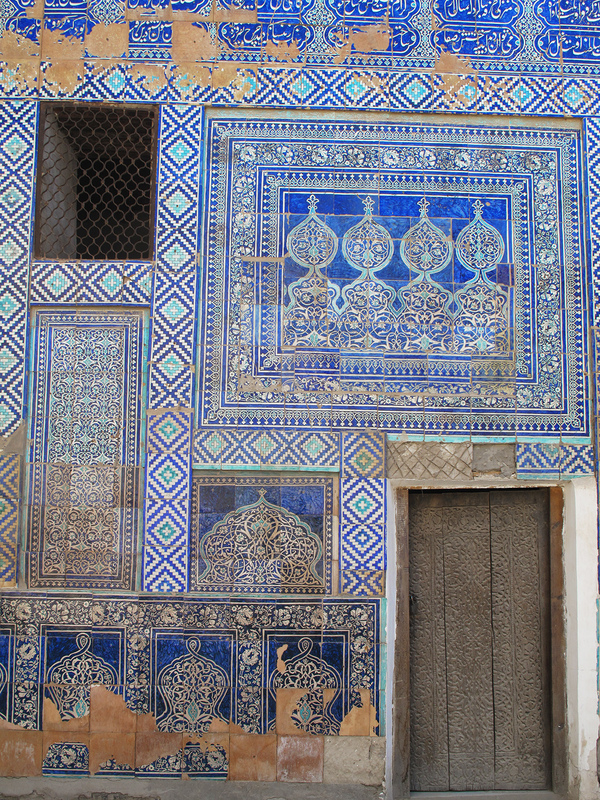 Tiled walls in courtyard of Kunya-Ark, Mosque, Khiva. 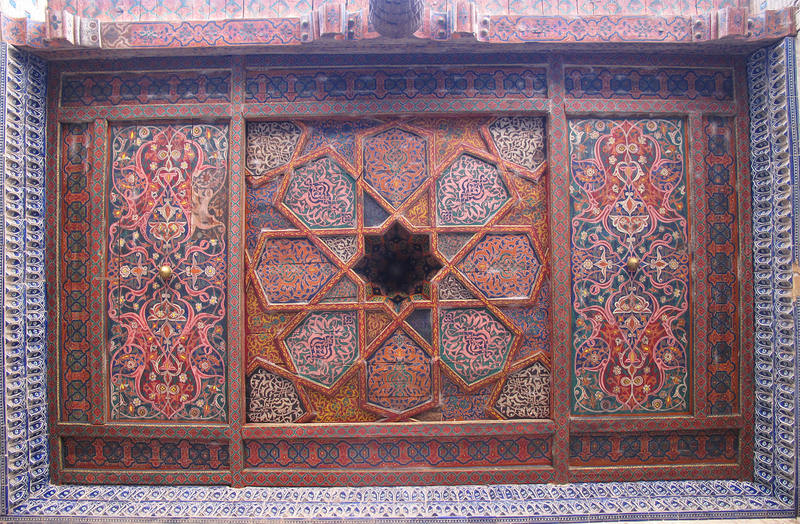 Kunya-Ark, Mosque Mihrab, with decorative tiles, Khiva. Meanwhile, central Asia had come into contact with European civilisations from the west, initially through the conquests of the Greek king Alexander the Great. Later it was the growing Roman empire that was to dominate the region and so the emerging Silk Road acted as a bridge between the East and the West. 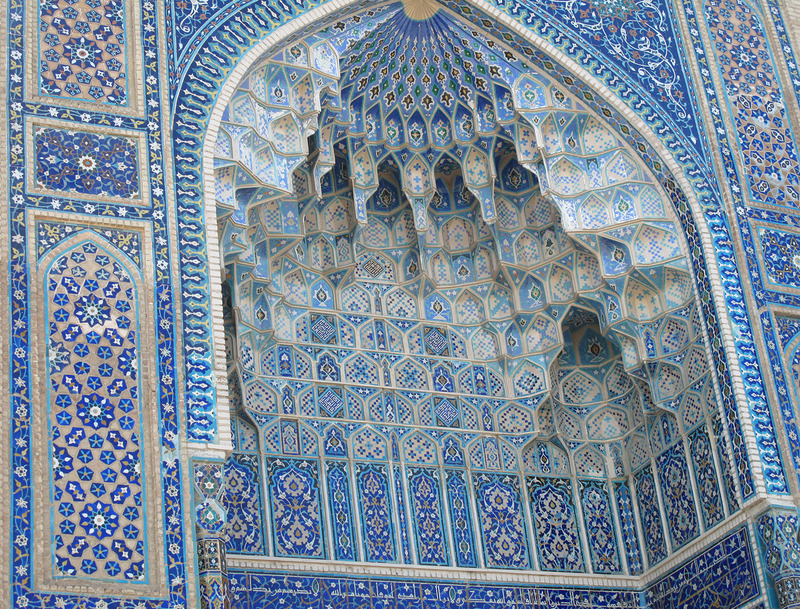 Kunya-Ark, Mosque Majolica tiles, Khiva. 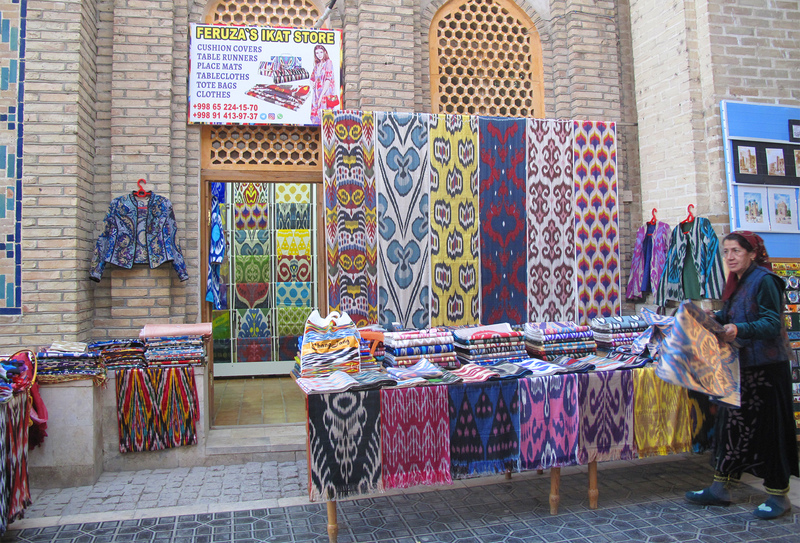 Vendors at the Harem, Kunya-Ark, Khiva, Uzbekistan. Silk was highly valued by other civilisations, especially Ancient Rome, so it became one of China’s main exports and the currency by which they paid for the goods that they required. Orange ceiling at Tash-Hauli Harem. 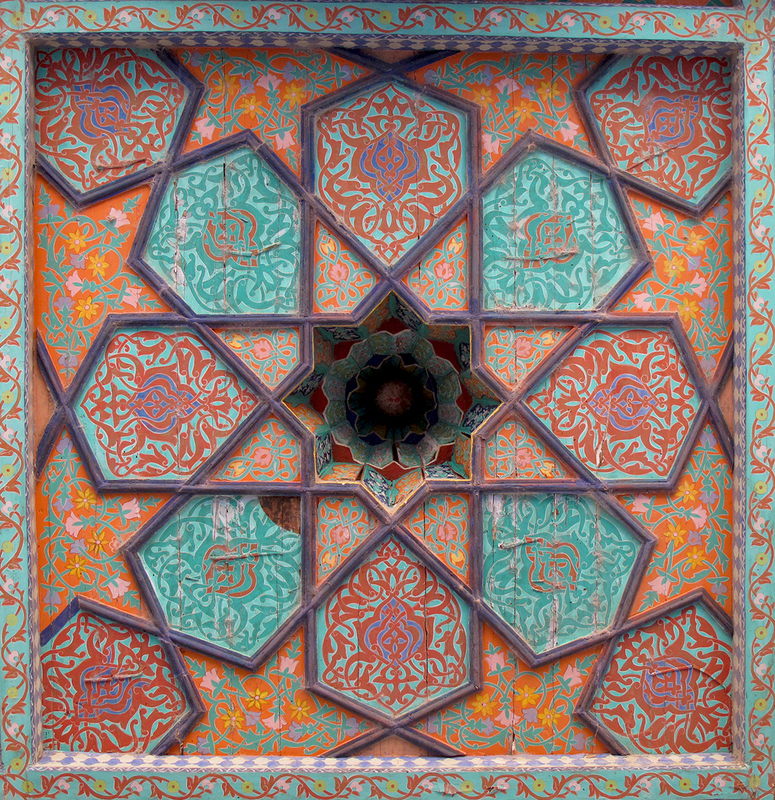 Ceiling at Tash-Hauli’s Harem, Khiva. Yellow ceiling at Tash-Hauli Harem. Tash-Hauli Harem, aivan room, with red ceiling. Tash-Hauli Harem, aivan room, with decorative ceiling. Song and Dance in Harem, Khiva, accordion player. Song and Dance in Harem, Khiva, accordion player and dancer. 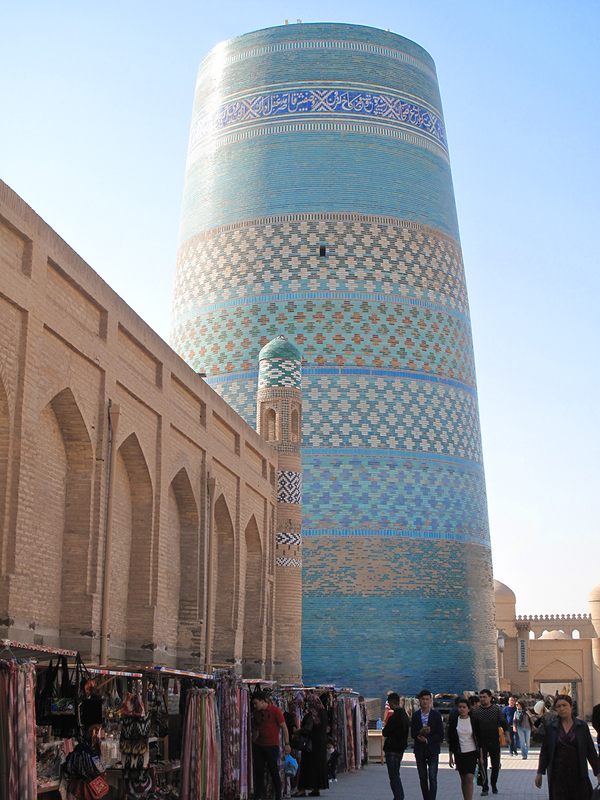 Khiva Islam- Khadja minaret, tallest in the city. 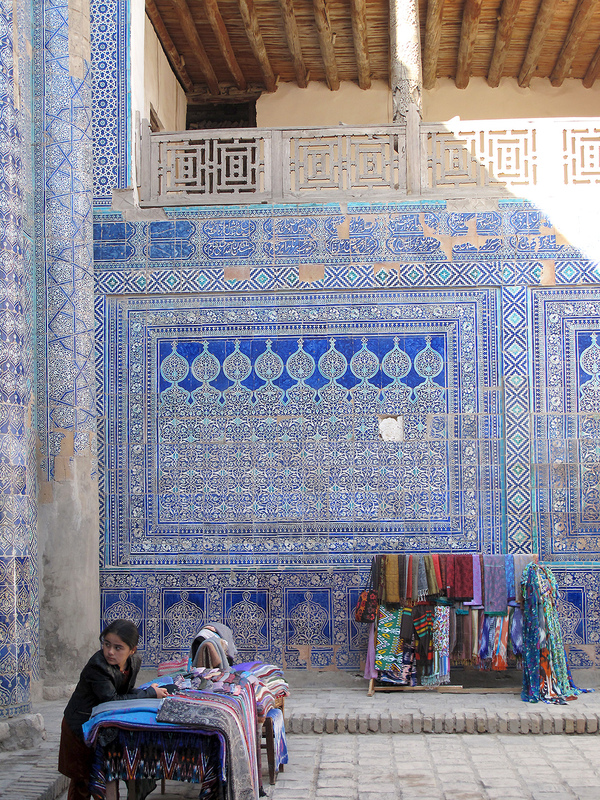 Bazaar outside Islam-Khadja Madrasah, Khiva, Uzbekistan. 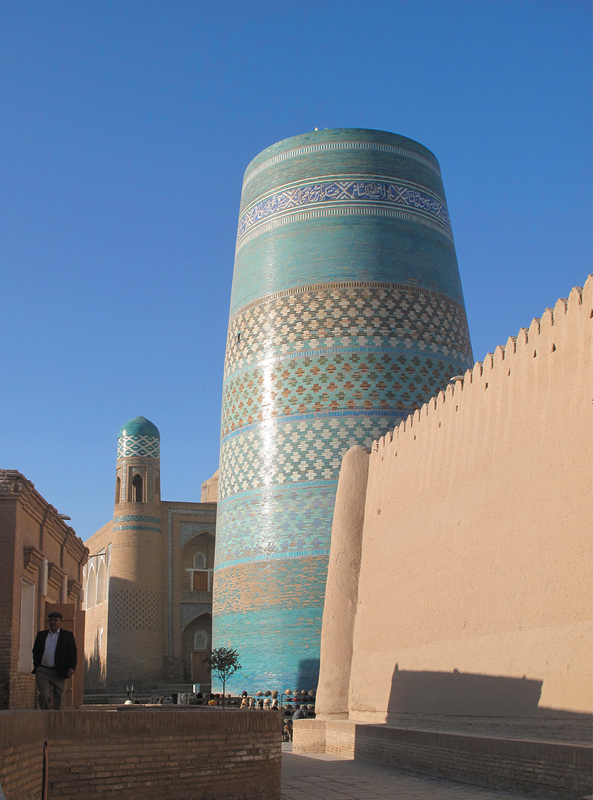 Our climb up the tallest Minaret in Khiva. 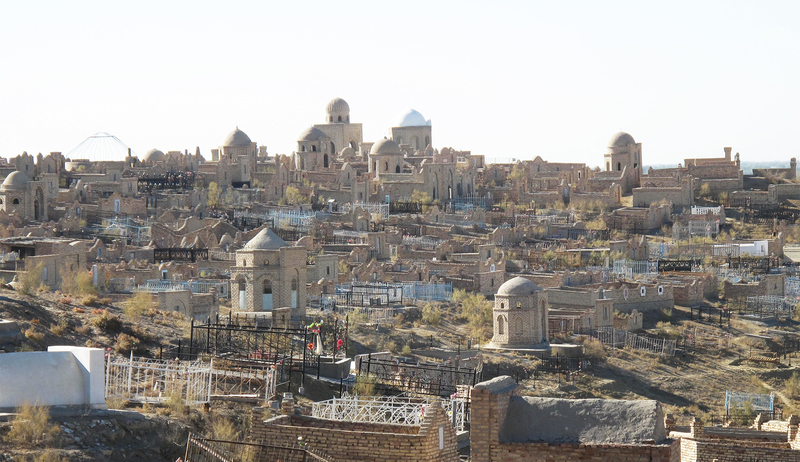 Looking over Khiva from Islam- Khadja Minaret, after our climb up the tallest Minaret in Khiva. 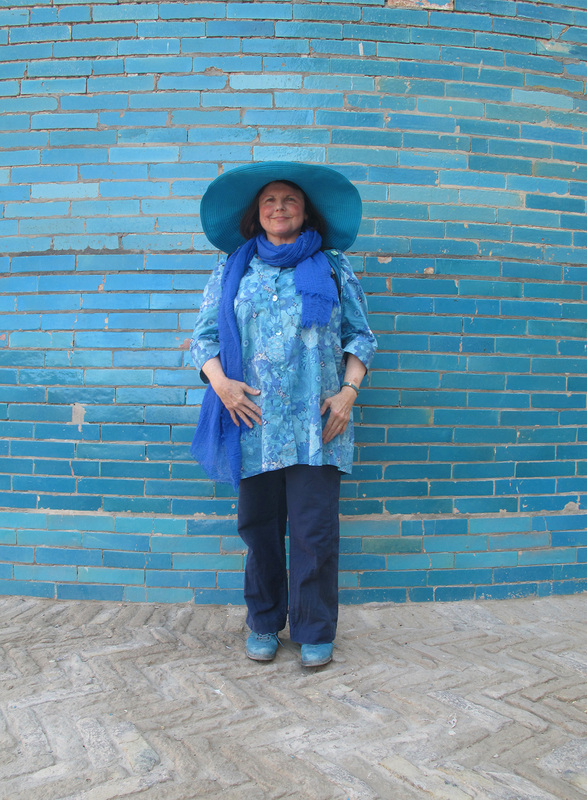 Photo of Seyid Islam- Khadja, Khiva. 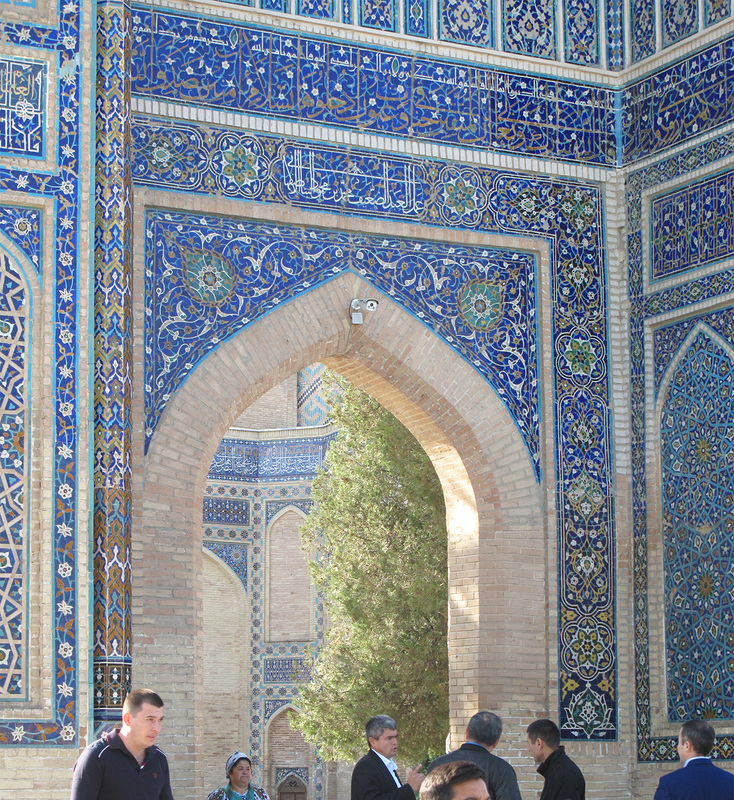 A modern wedding, couple at Islam-Khadja Madrasah, Khiva. 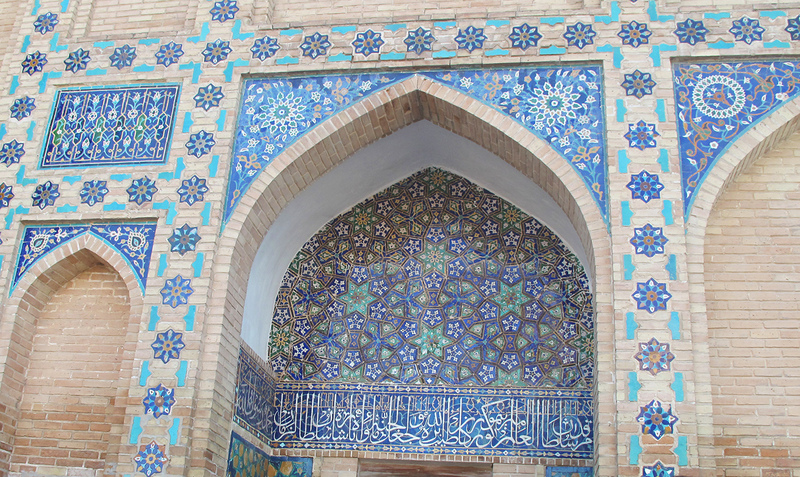 Madrasah of Khurdjum-Khan detail of arch. 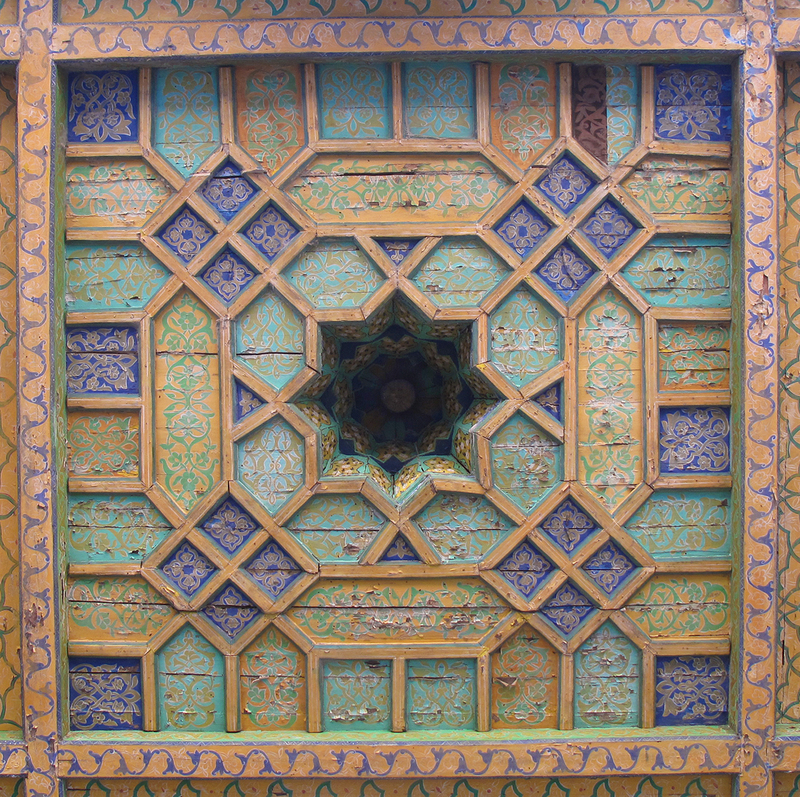 Ceiling at Kunya-Ark,’Old Fortress’, Khiva. 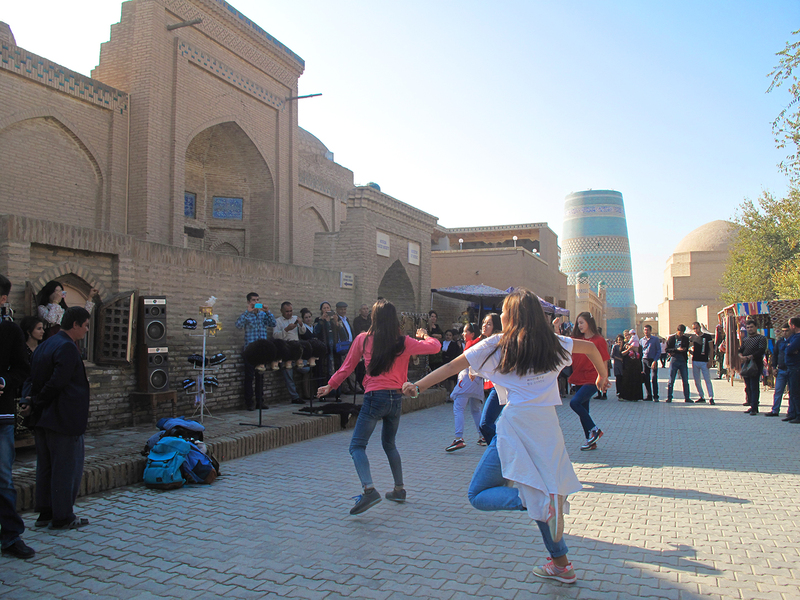 Khiva youngsters dancing to modern Grime music. 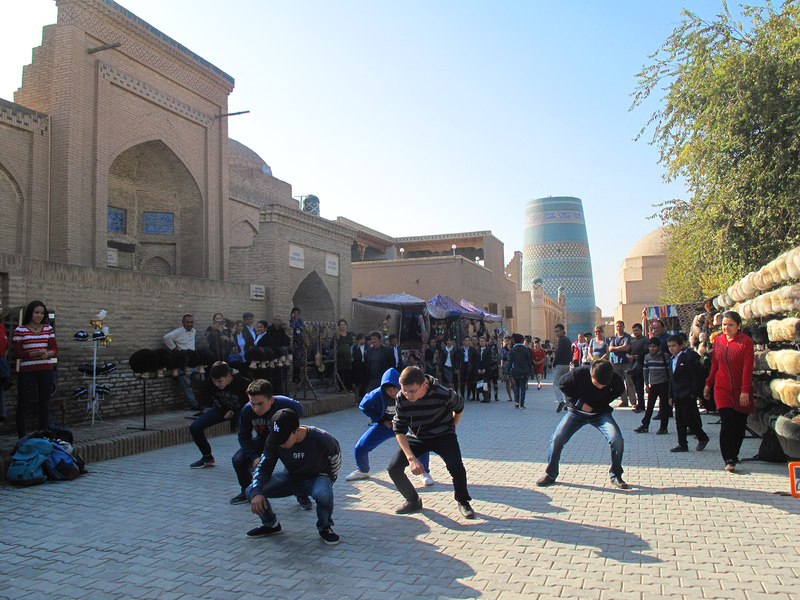 Khiva lads dancing to modern Grime music. Locals selling their vegetables at the market, Khiva. 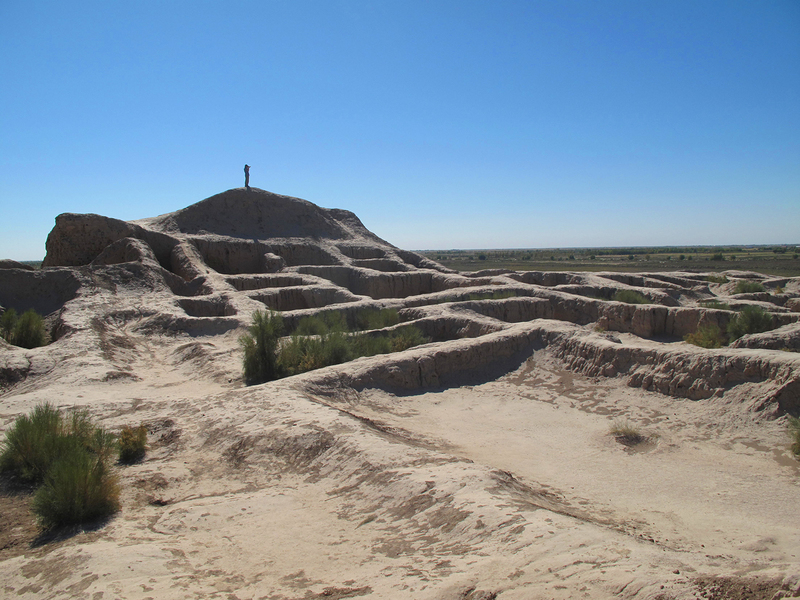 Uzbek Muslim and Catholic cemetery, Nukus. 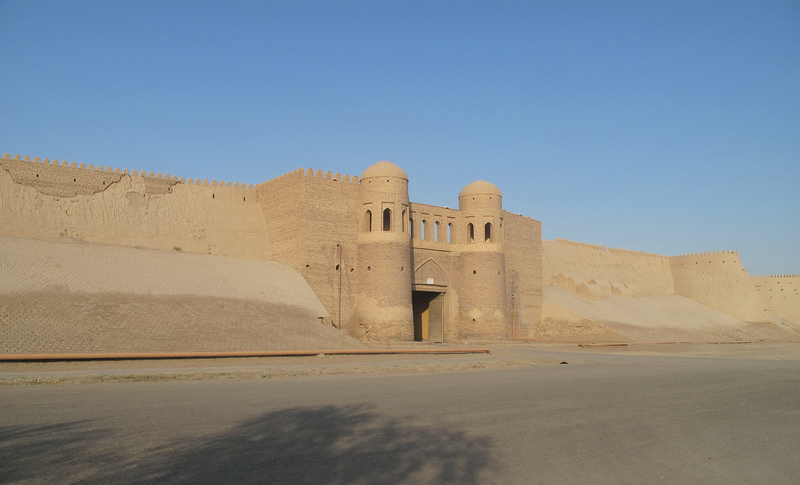 Route to Bukhara, along the Silk Road, by the Turkmenistan border. 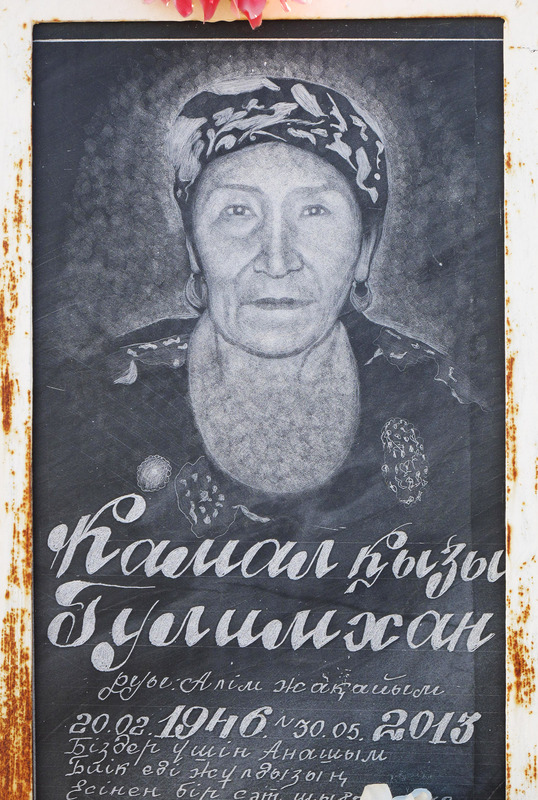 Grave portrait engraved on slate, Nukus. Tambourine seller Bukhara, Richard bought one of these. 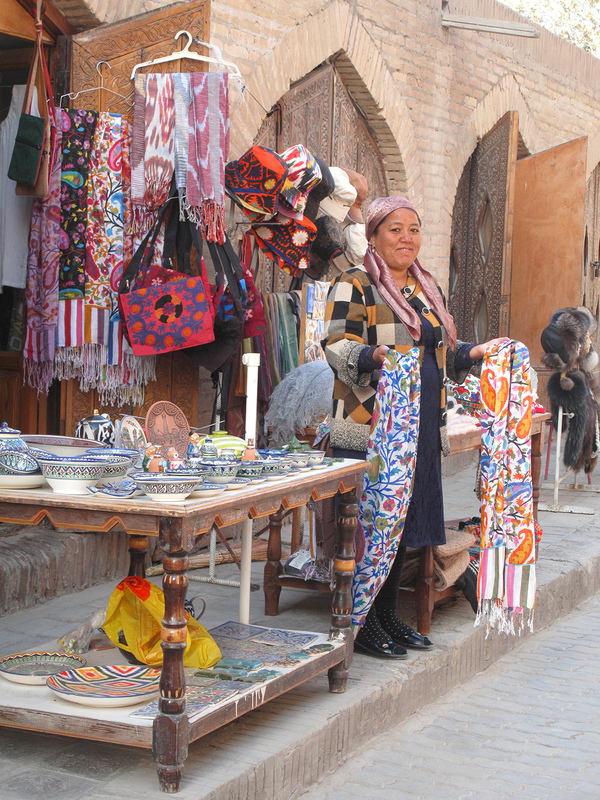 Knives made from steel rope and bicycle chain, Bukhara. 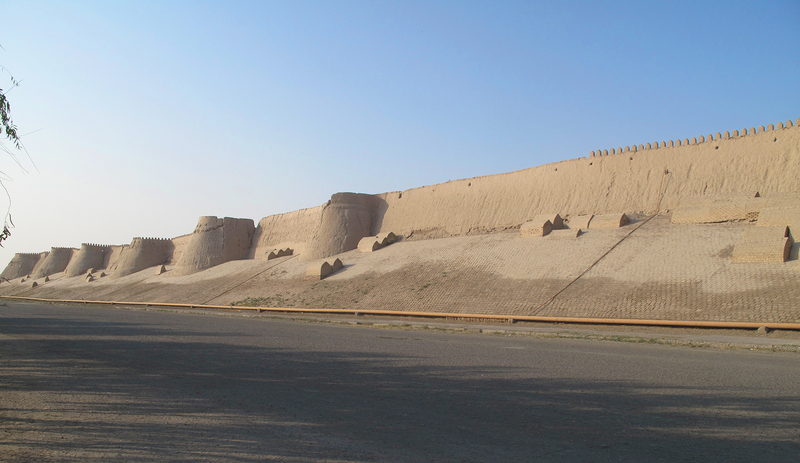 The Silk Road stretched for around 4,000 miles and few people would have travelled the entire length of it themselves. 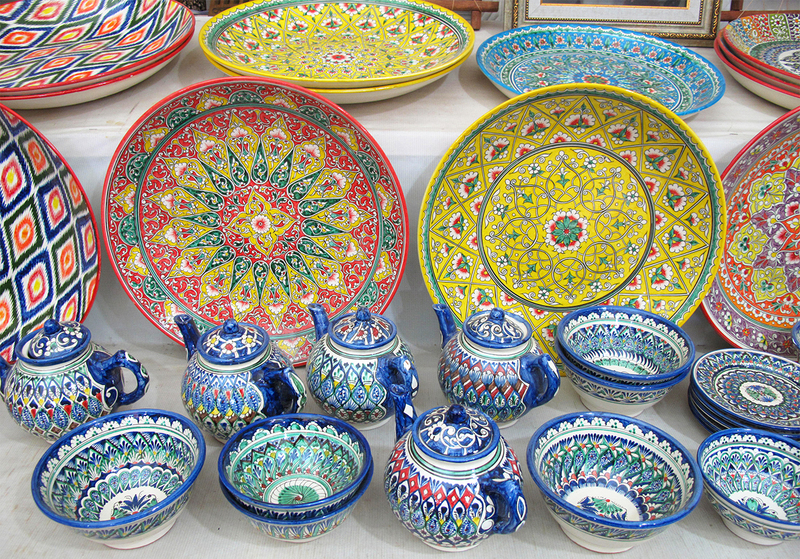 Generally goods were carried by a number of different traders, having been exchanged several times along the way. 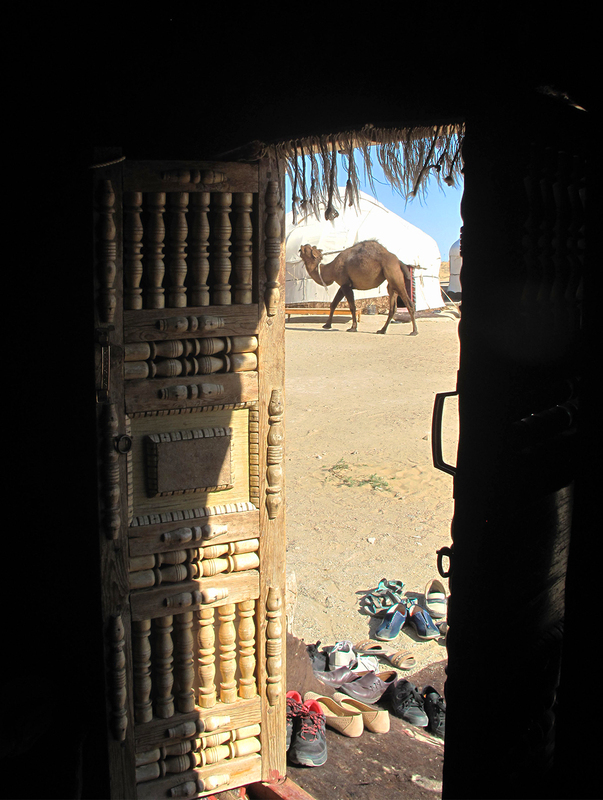 The traders themselves journeyed in groups called ‘caravans’, sometimes containing hundreds of people, riding on camels and horses or travelling by foot. It could be a treacherous and potentially dangerous journey, so being part of a caravan was also a protective factor. 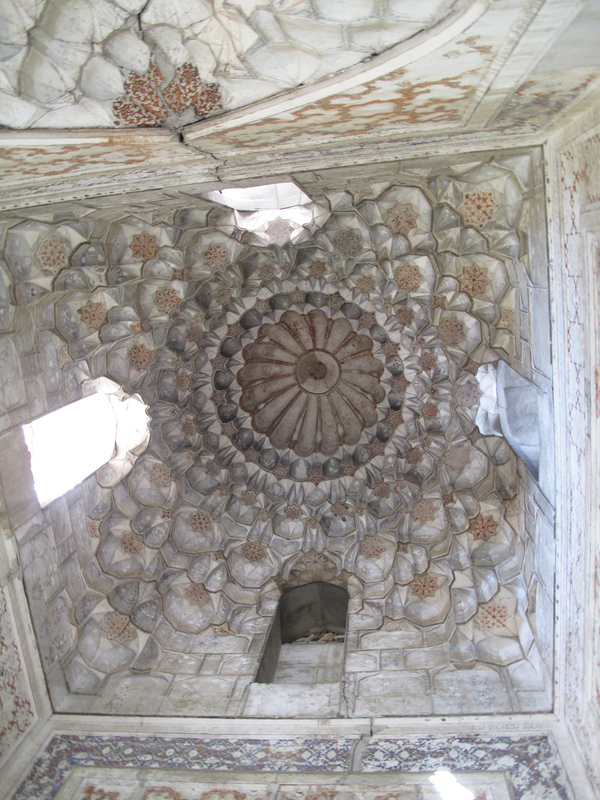 Mosque ceiling detail, Bolo-Hauz, Bukhara. Bolo-hauz Mosque detail of stalactite capital. 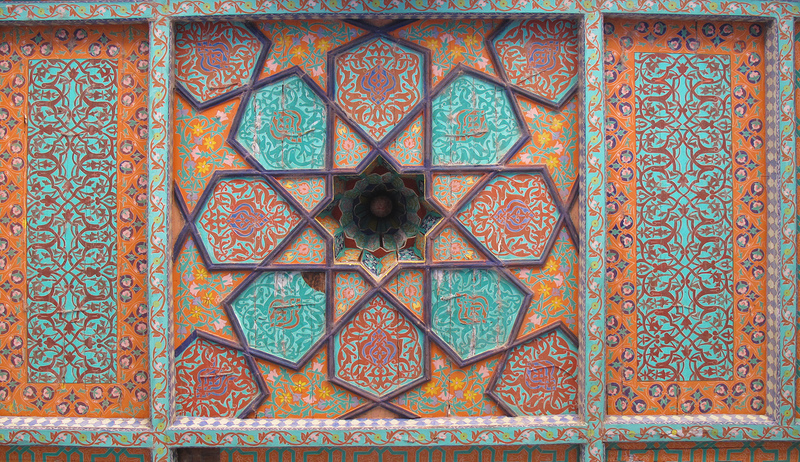 Mosque ceiling closer detail, Bolo-Hauz, Bukhara. Silk was not the only valuable commodity traded along this route. 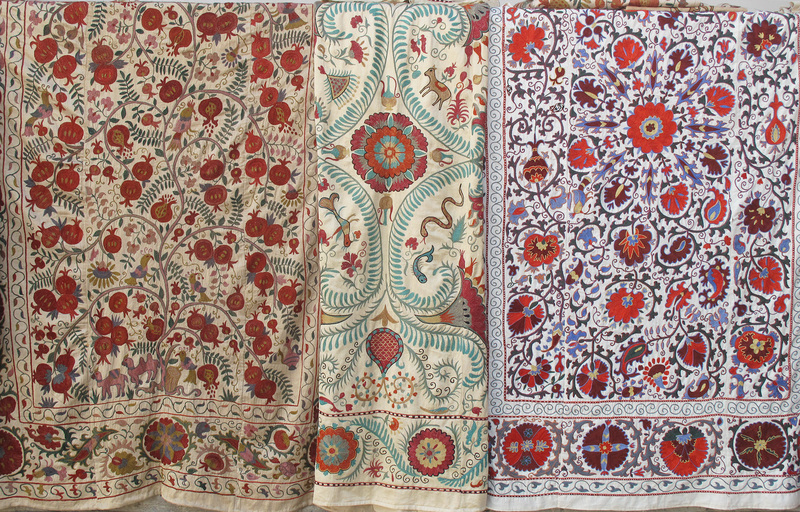 For thousands of years cotton, wool, glass, jade, lapis lazuli, gold, silver, salt, spices, tea, herbal medicines, fruits, flowers, horses, musical instruments also travelled this route, as well as architectural, philosophical, and religious ideas. 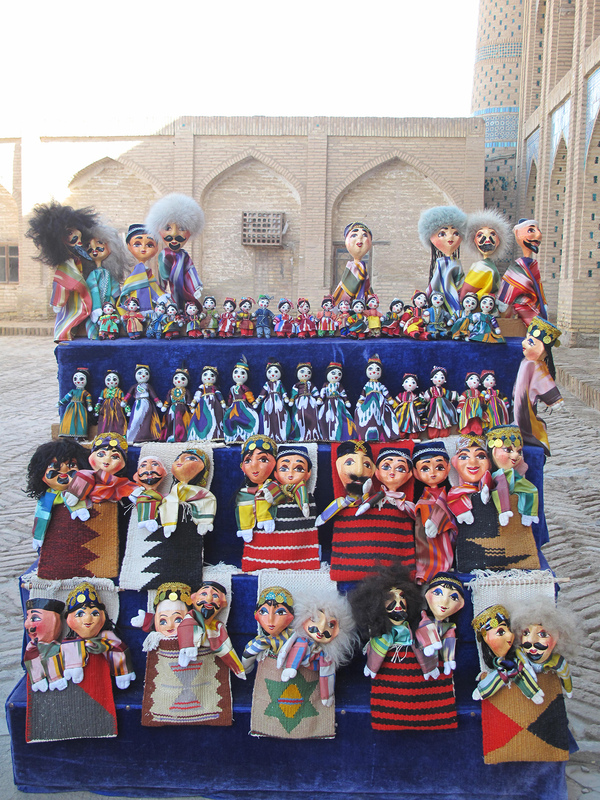 Suzanis for sale in Ark Citadel, Bukhara. 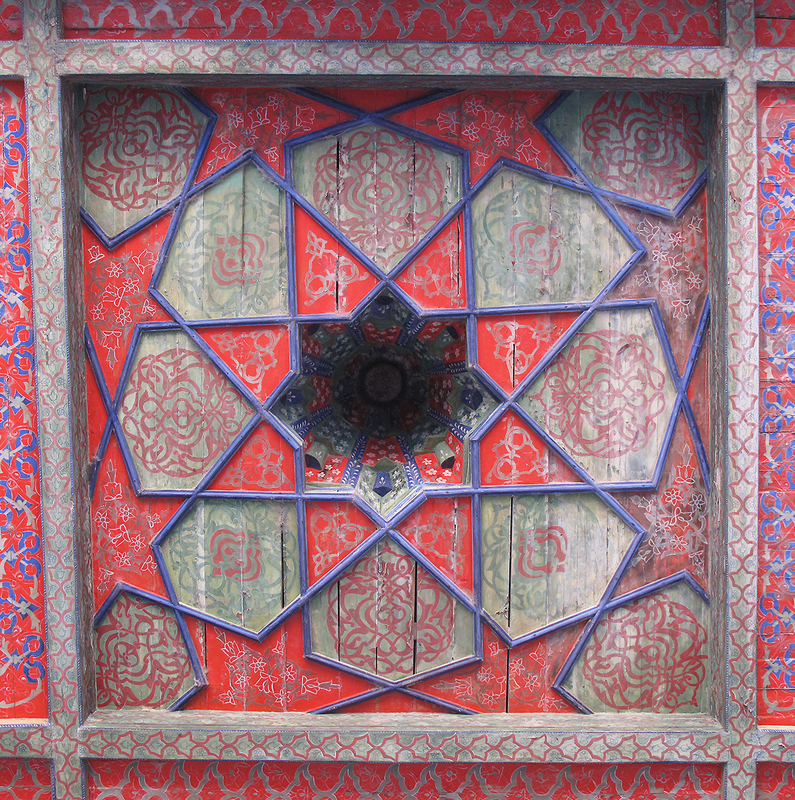 Detail of Pomegranate on Suzani, at Bukhara. 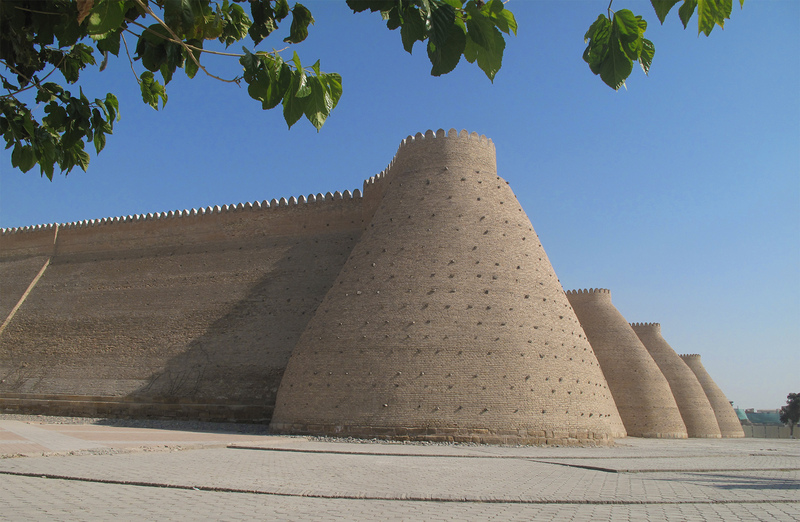 Medieval trading domes, or ‘toki’, Bukhara. 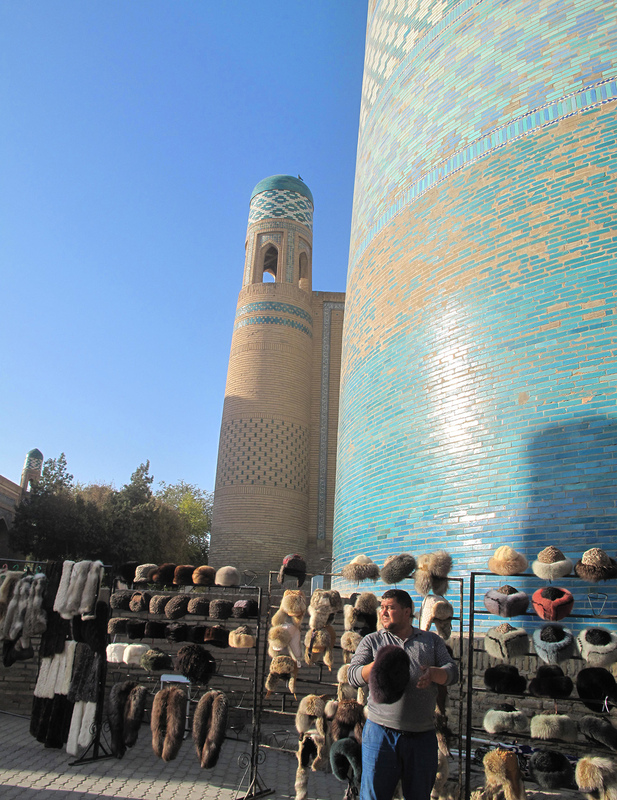 Stalactite dome in bazaar, Bukhara. 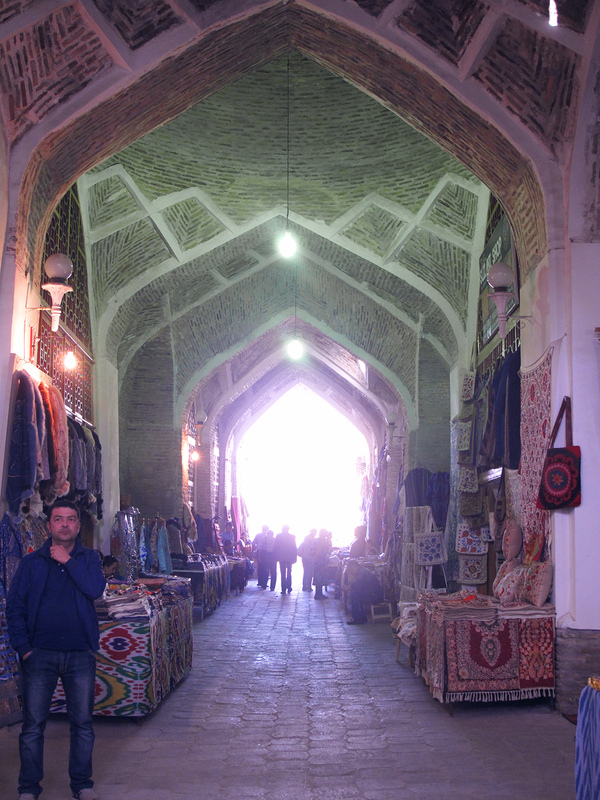 Inside trading domes, the Bazaar at Bukhara. 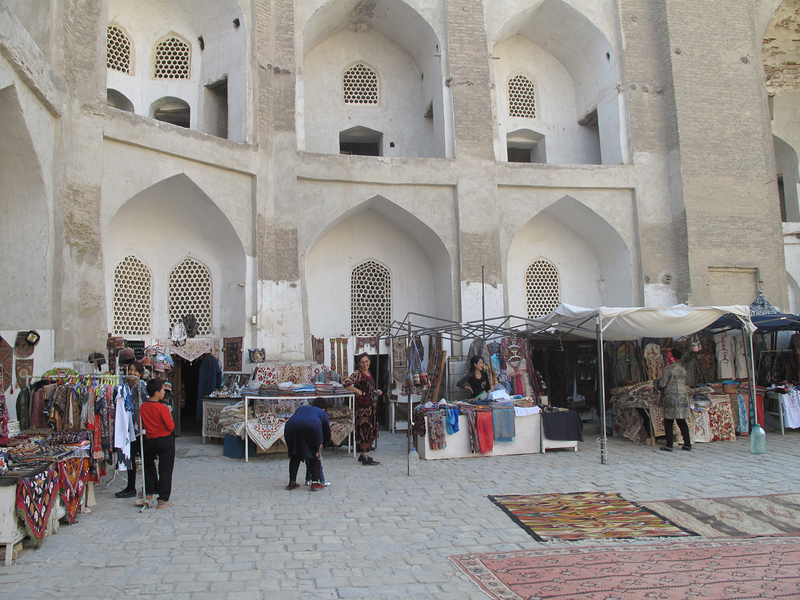 Open courtyard of Bazaar, Bukhara. 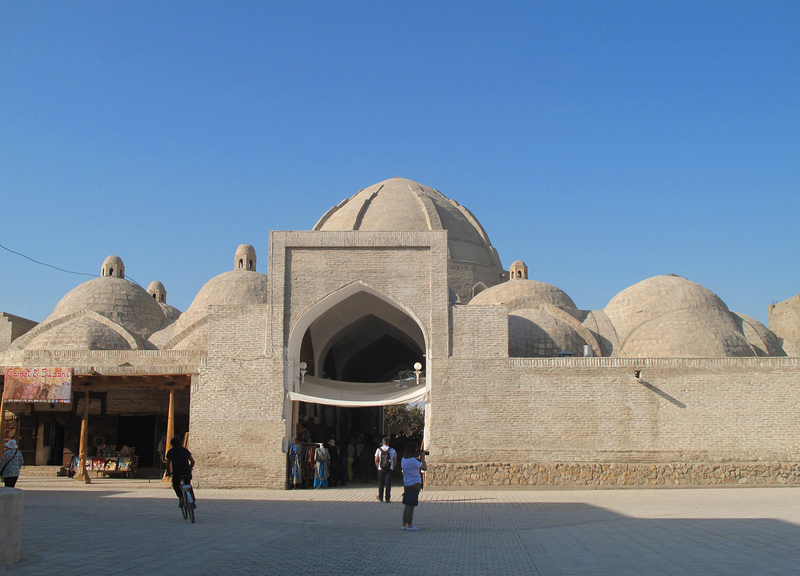 Arches and aivans, Kalyan Mosque, Bukhara. 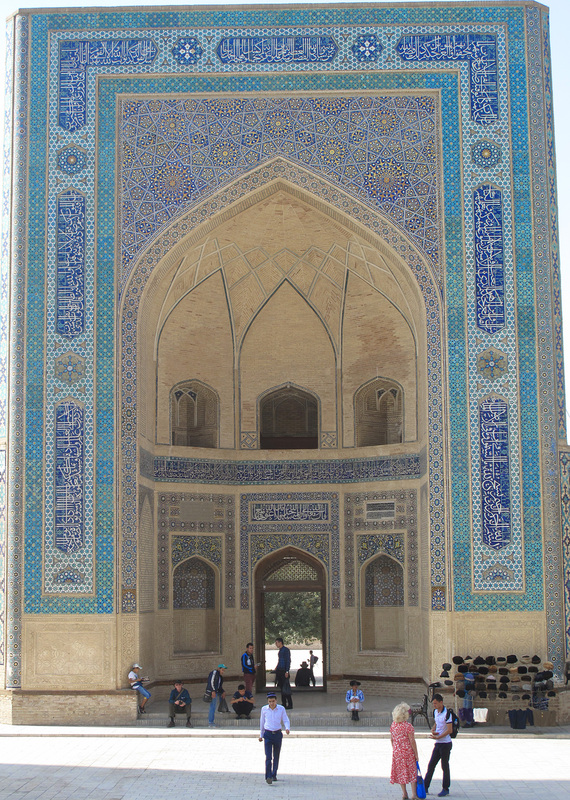 Entrance to Kalyan Mosque, Bukhara. 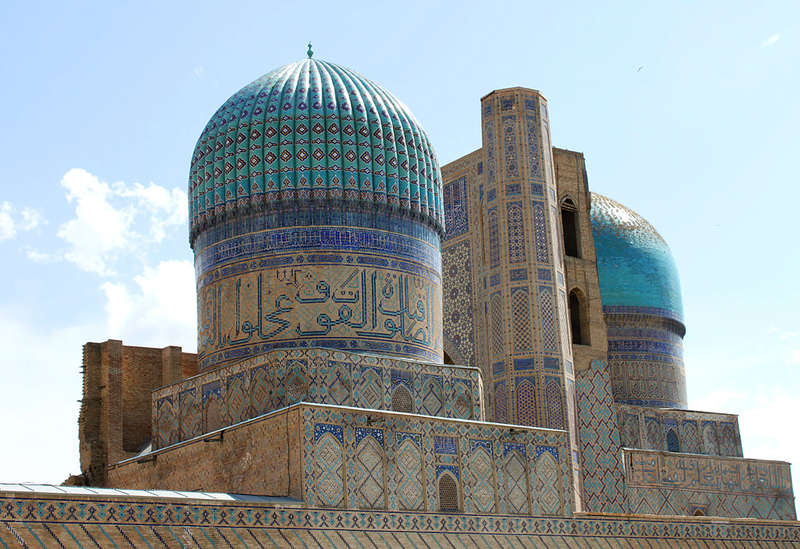 The land that is now Uzbekistan was once at the heart of the ancient Silk trade route, connecting China with the Middle East and Rome. 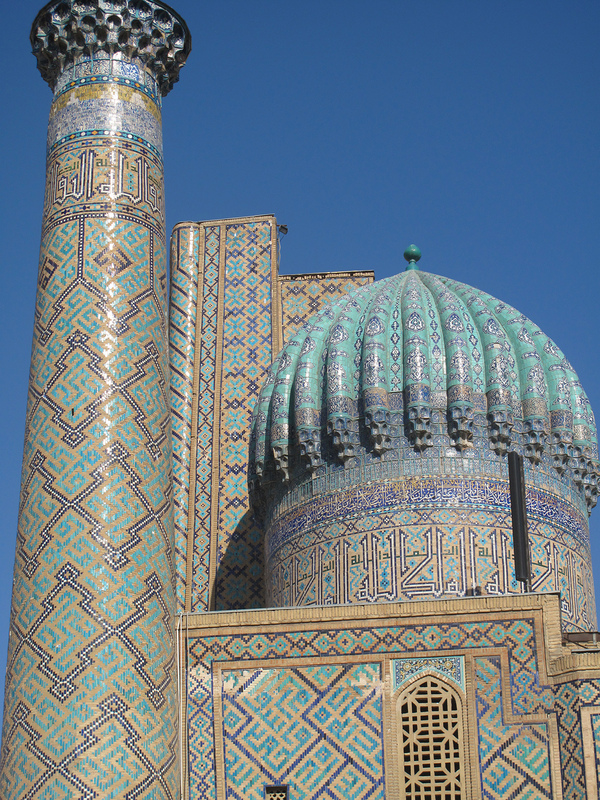 Uzbekistan was part of the ancient Persian Empire, one of the world’s oldest civilised regions. It was later conquered by Alexander the Great in the 4th century B.C. During the 8th century, the nomadic Turkic tribes living there were converted to Islam by invading Arab forces who dominated the area. Under Ghengis Khan the Mongols took over the region from the Seljuk Turks in the 13th century, and it later became part of Tamerlane the Great’s empire, (historically known as Amir Timur) and that of his successors, until the 16th century. 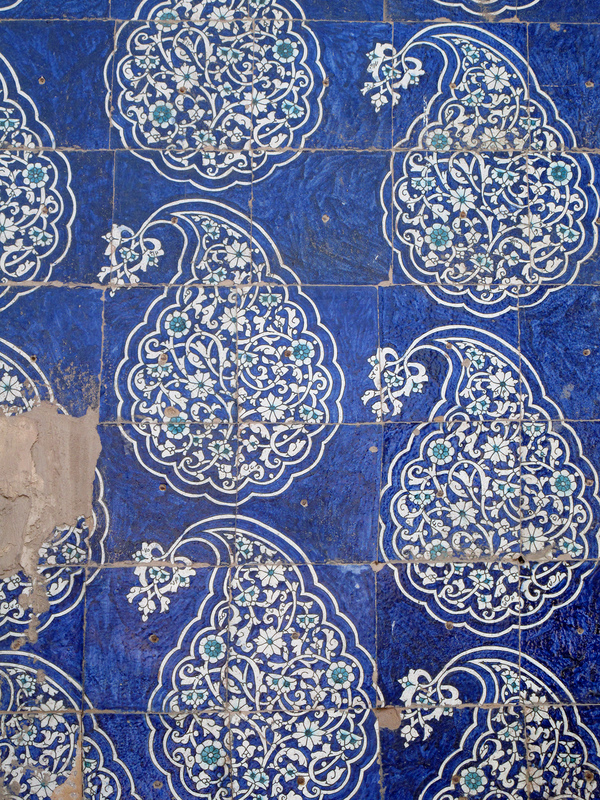 Tile detail at Ulugbek Madrasah, Bukhara. 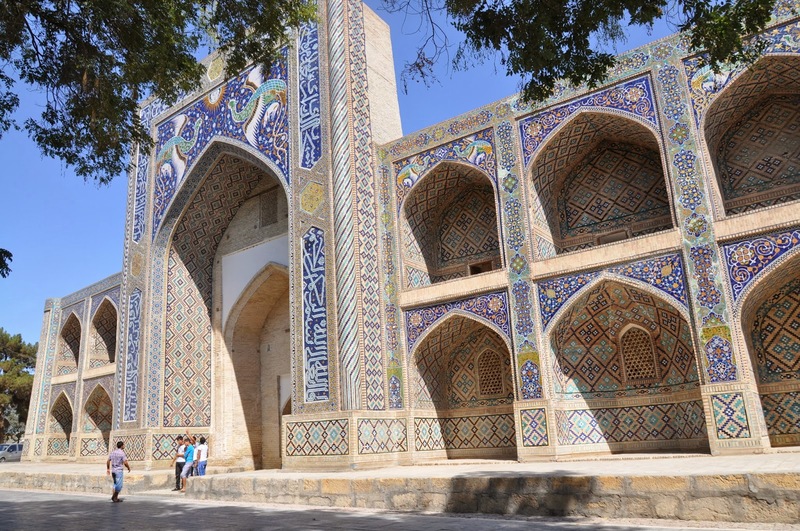 Throughout these turbulent times, the Uzbek cities of Samarkand, Bukhara, and Tashkent, situated on major trade routes to China, India, Persia, and Europe, were centres of prosperity, culture, and fabulous luxury. 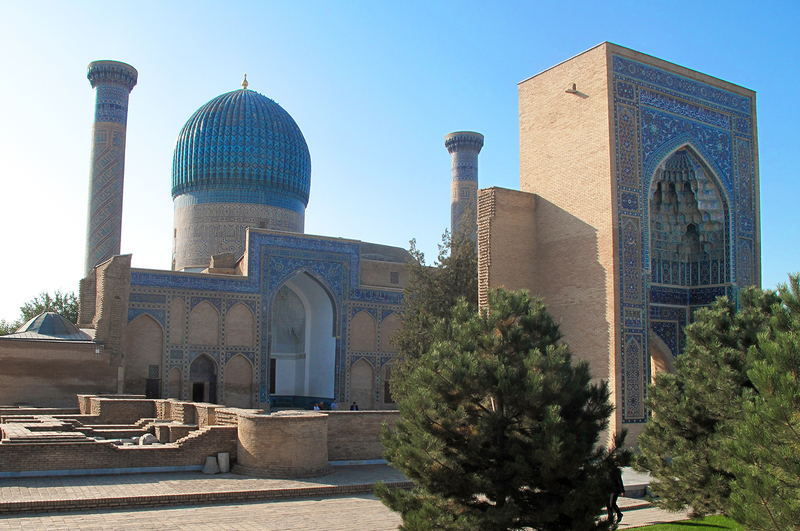 In the early 16th century, the Uzbeks, formerly called Sarts, invaded the region from the northwest. 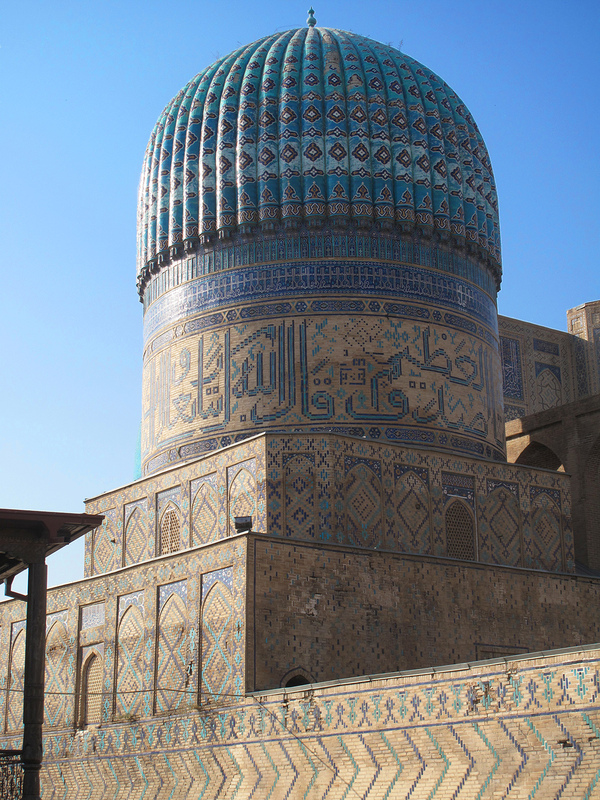 A remnant of the empire of the Golden Horde, they took their name from Uzbeg Khan (d. 1340), from whom their dynasty claimed descent. 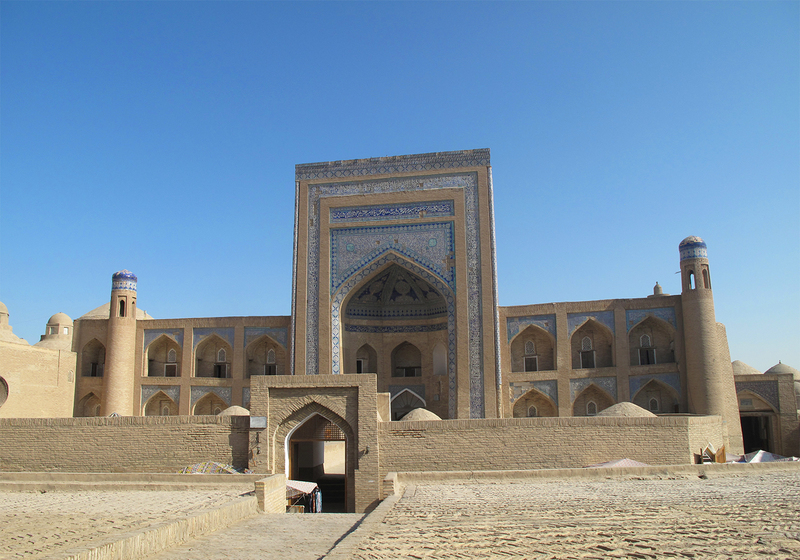 The Uzbeks invaded the territory and merged with the other inhabitants in the area, however their empire gradually broke up into separate Uzbek principalities; the Khanates of Khiva, Bukhara, and Kokand. These city-states resisted Russian expansion into the area but were eventually conquered by the Russian forces in the mid-19th century. 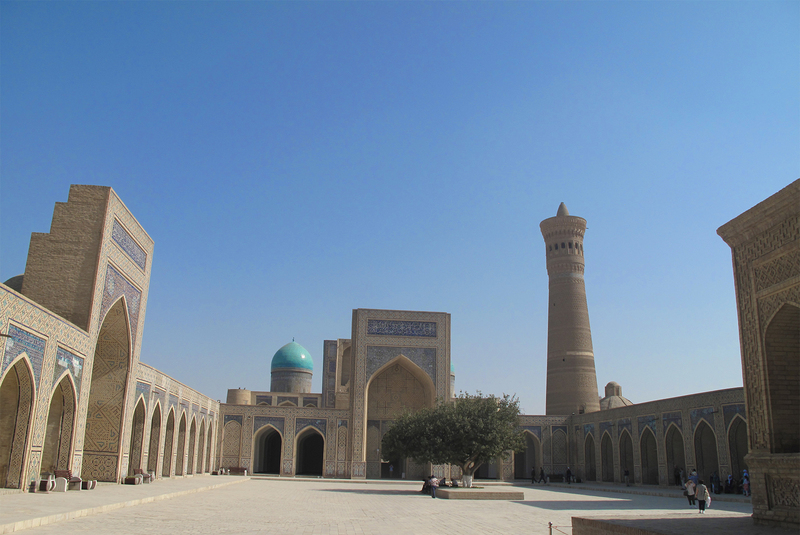 The territory was made into the Uzbek Republic in 1924 and became the independent Uzbekistan Soviet Socialist Republic in 1925. 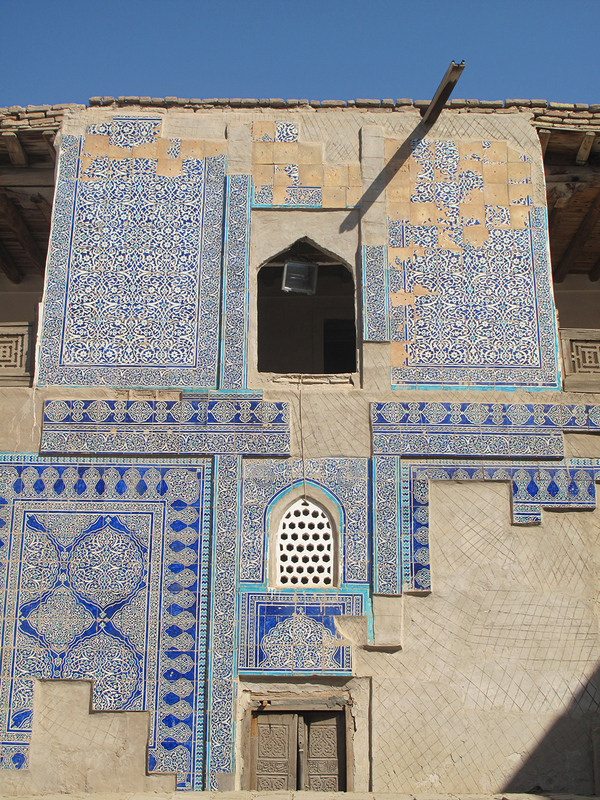 Madrasah of Nadir Divan-Beghi, Bukhara. 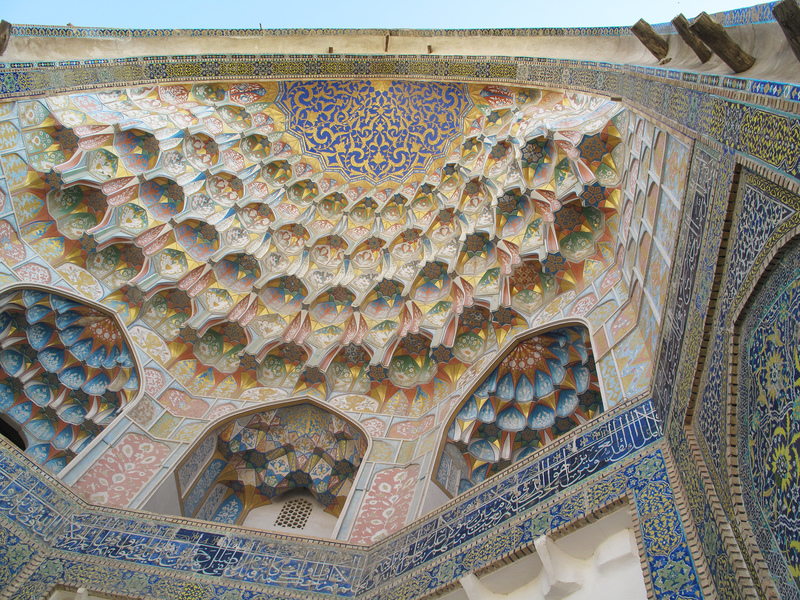 Under-dome stalactite systems,and complex ‘sails’,at the Madrasah of Abdal-Aziz-Khan, Bukhara. 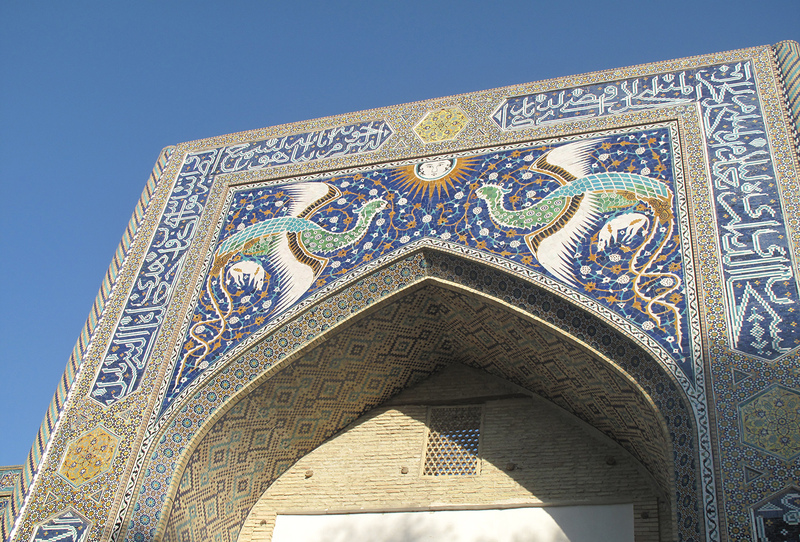 Decorative arch, Gur-Emir Mausoleum, Samarkand. 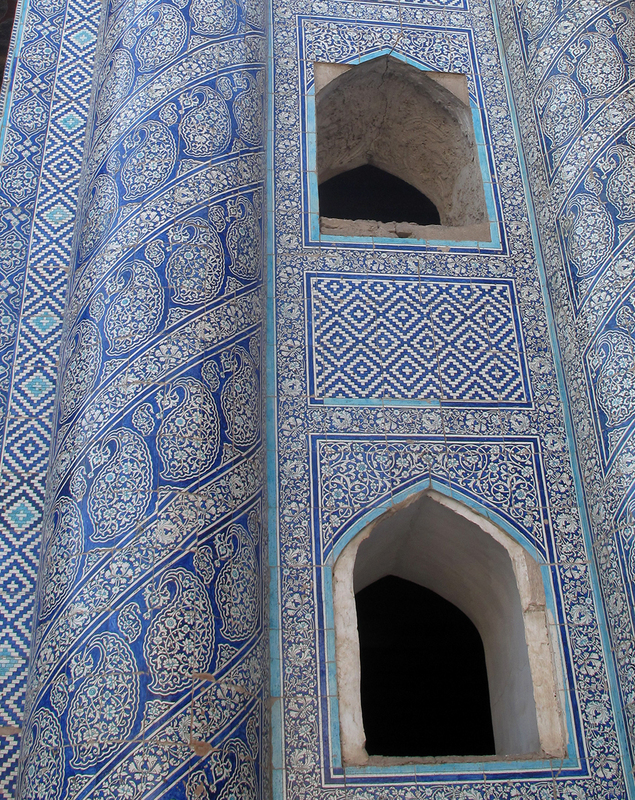 Stalactite arch, Gur-Emir Mausoleum, Samarkand. 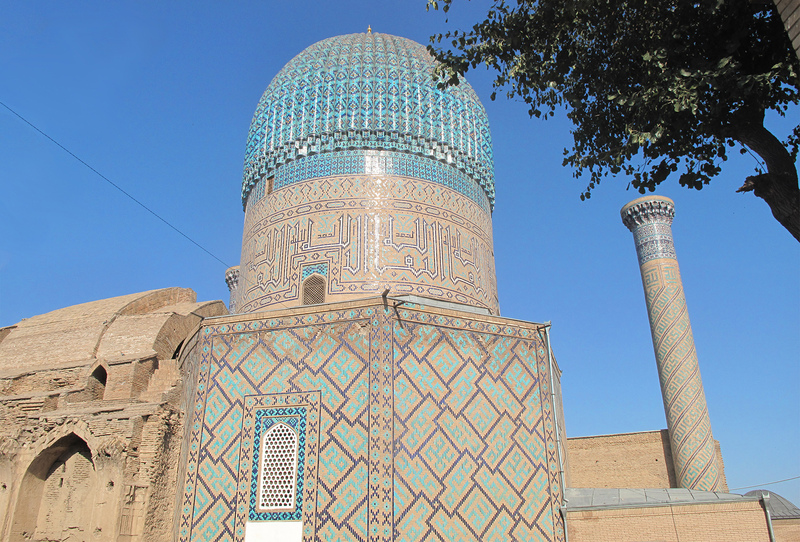 Gur-Emir Mausoleum, Samarkand showing dome. 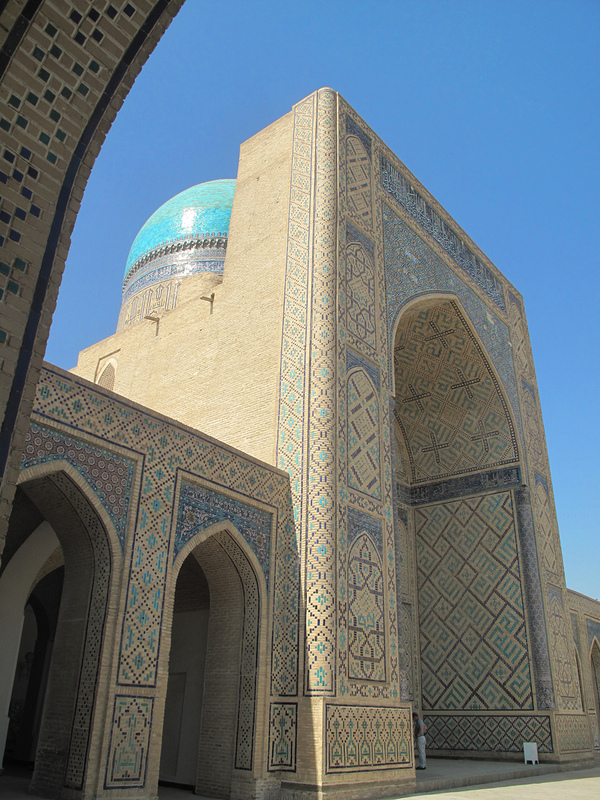 Tillya-Kari Madrasah, Registan Square, Samarkand. 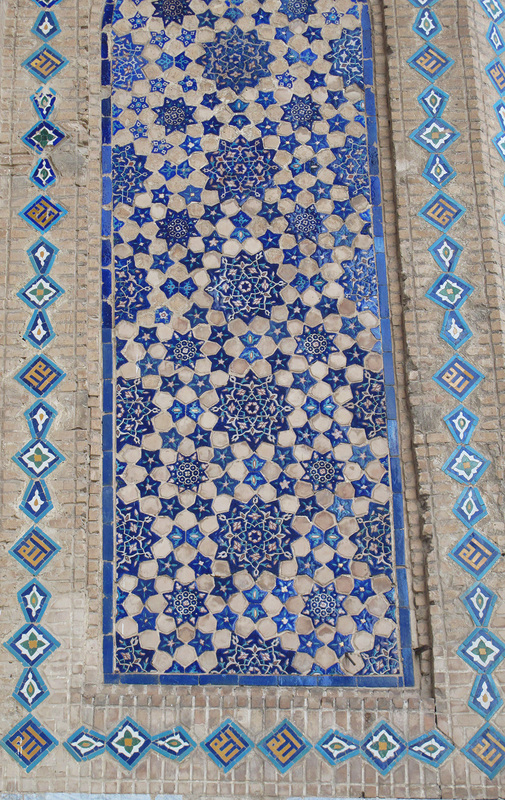 Tiles at Tillya-Kari Madrasah, Samarkand. 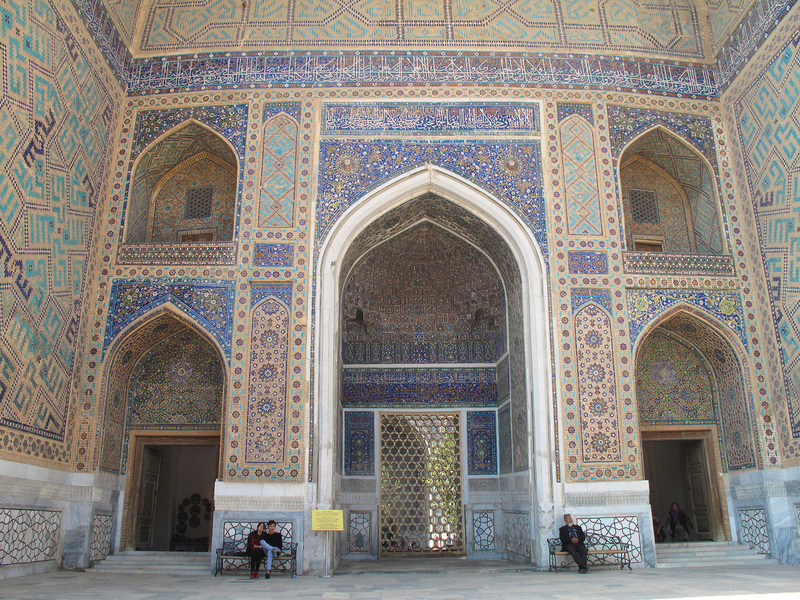 Tillya-Kari Madrasah, interior, Registan Square, Samarkand. 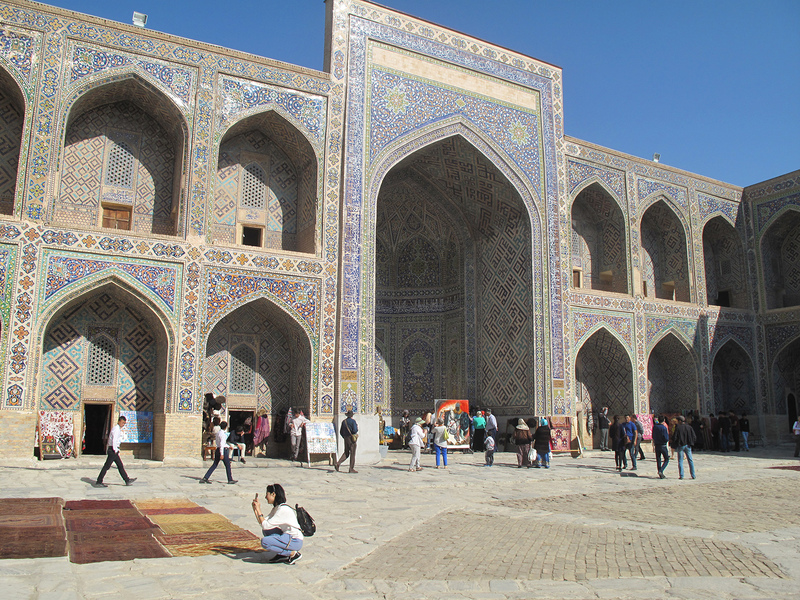 Sher-Dor Madrasah, inner courtyard with vendors, Samarkand. 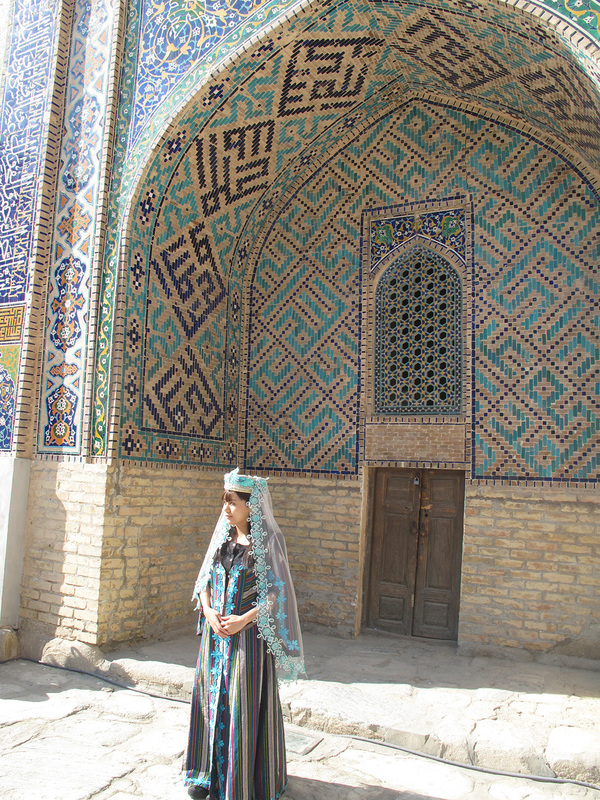 Woman in Sher-Dor Madrasah, Samarkand. 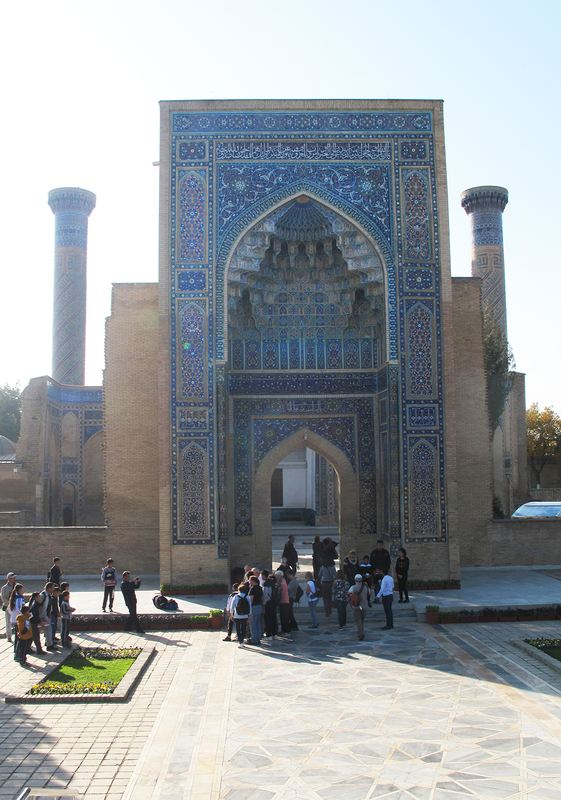 Ulugbek Madrasah, Registan Square, Samarkand. 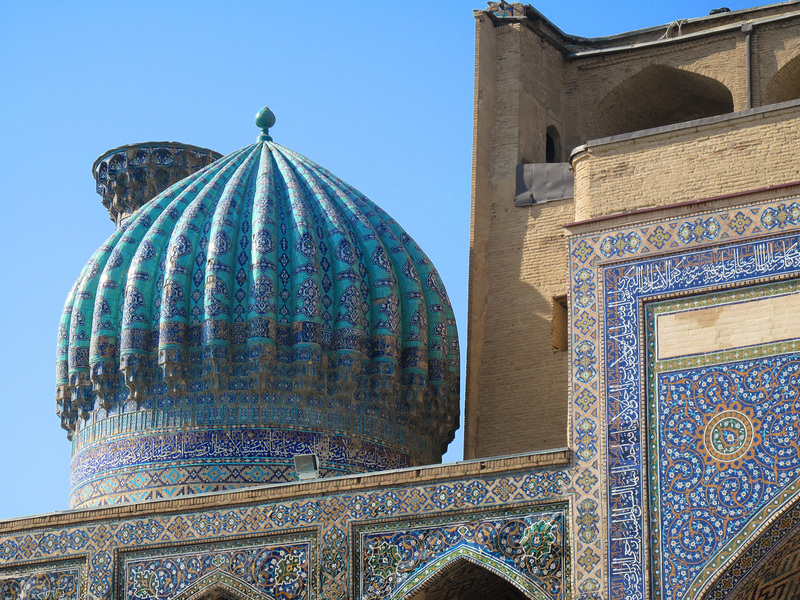 Samarkand, Bibi- Khanym Mosque, dome. 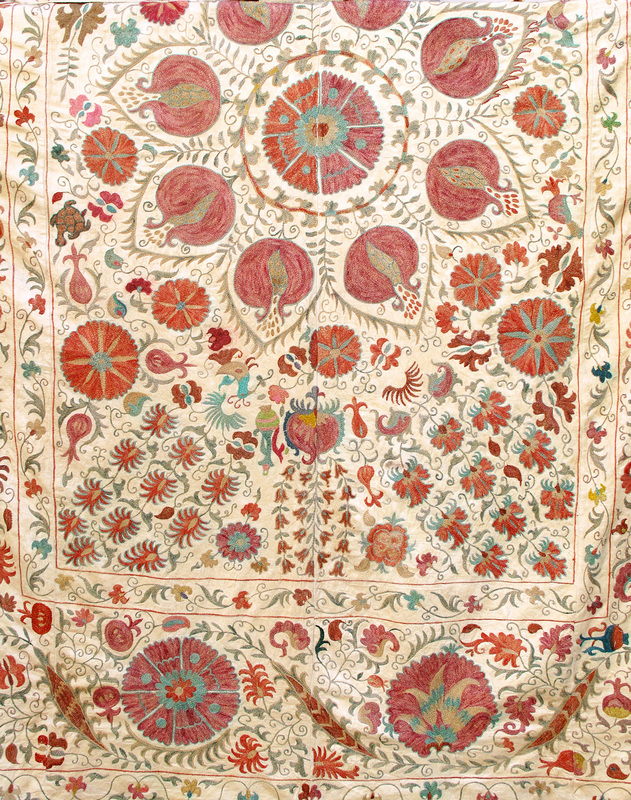 Silk woven carpet, coloured using natural dyes. Lady working a classic design on silk carpet made with naturally dyed silk threads. 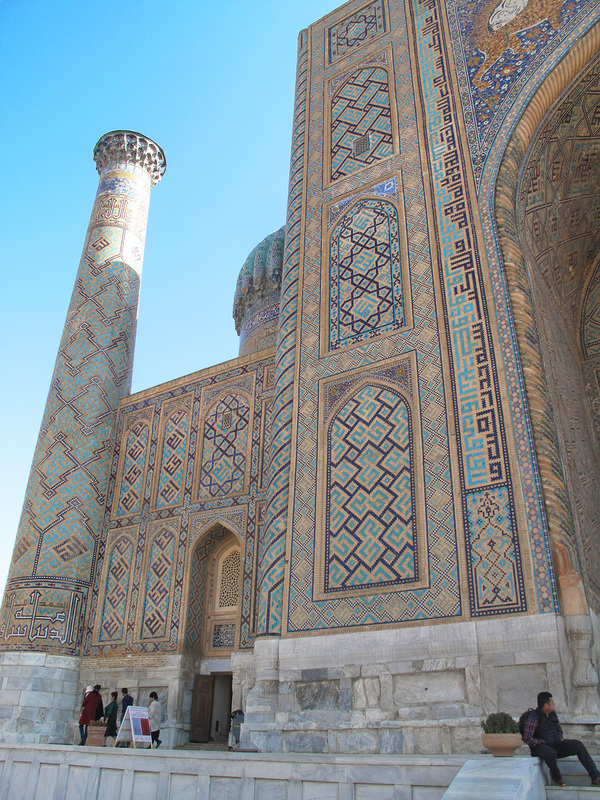 Uzbekistan is situated in central Asia between the Amu Darya and Syr Darya Rivers, the Aral Sea, and the slopes of the Tien Shan Mountains. It is bounded by Kazakhstan in the north and northwest, Kyrgyzstan and Tajikistan in the east and southeast, Turkmenistan in the southwest, and Afghanistan in the south. 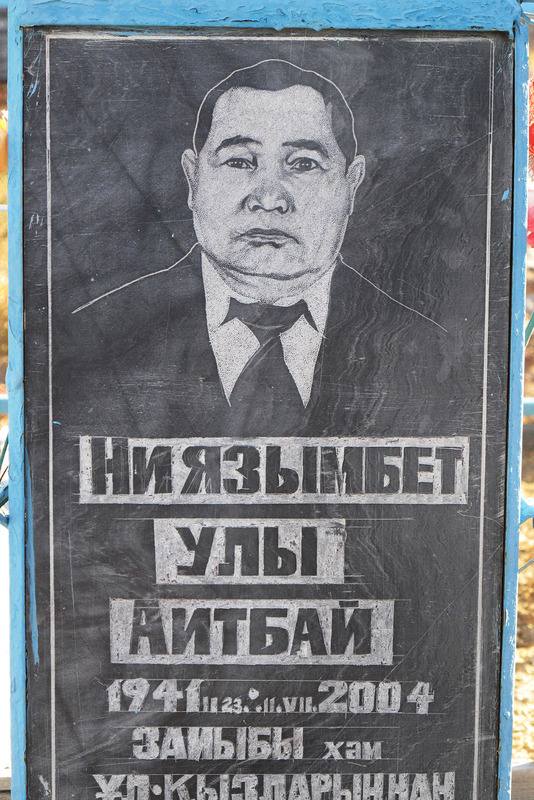 The republic also includes the Karakalpakstan Autonomous Republic, with its capital, Nukus. Yes that really appealed to me, I loved all the blue and white ! Amazing contrast of barren desert sand to colourful patterns on fabric and buildings al caught on camera through your artistic eyes. Another wonderful journey Marina! Amazing post! 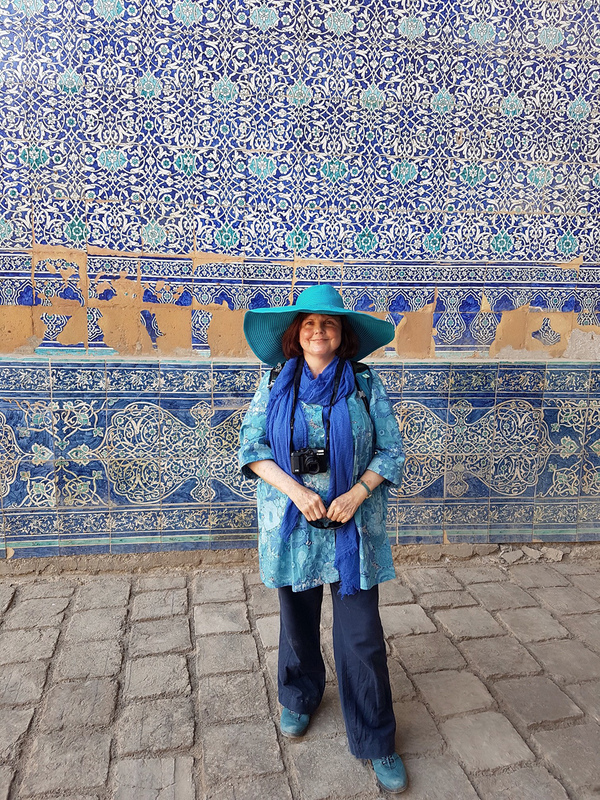 I’ve long known a lot about the history of Silk Road and all the cities that used to be part of it, just like Samarkand, are definitely on my bucket list. 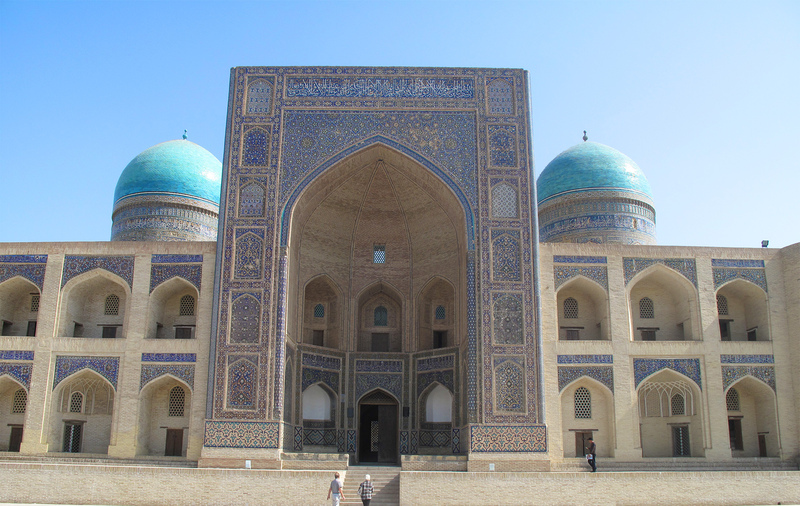 Thanks a lot for sharing this article with some of the most amazing pictures of Uzbekistan! I wish I can visit the country in the near future! Looking forward to the opportunity to enjoy the sights and experiences which you depict so well. 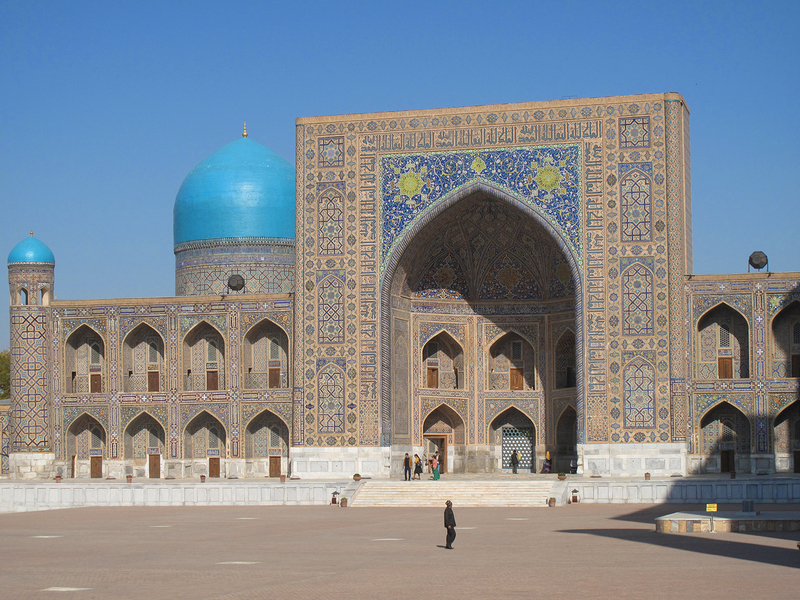 Along with as group of my friends we will be visiting the places you mention in Uzbekistan later this year.